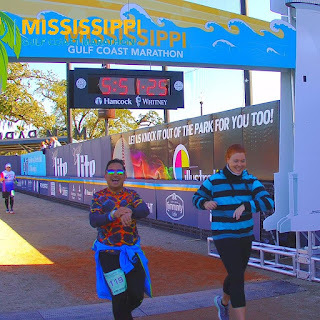 Mississippi was originally to be checked off my calendar in January 2017, at the Mississippi Blues Marathon in Jackson, but when that got cancelled due to a freak ice storm crippling the south, I added the Mississippi Gulf Coast Marathon to my calendar at the end of 2017 instead, and the stars aligned for me to get the anthem gig as well, after being so well received by the race directors of the Louisiana Marathon, who also owned this race. The December race would be having its second running, starting in Pass Christian, and following the gulf shore all the way into Biloxi. 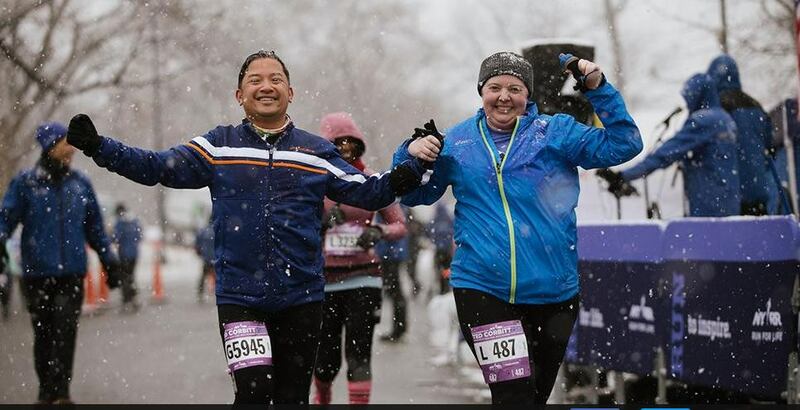 The weekend would start though, with a 15K race in New York - the annual Ted Corbitt race, which in this year's edition would be marked with snow flurries throughout from even before it's 8:30am start. 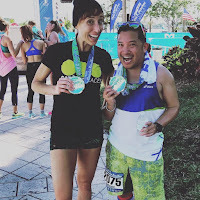 Because of my nagging left calf strain injury that had bothered me since the Flying Monkey Marathon three weeks earlier, I opted to stay very conservative with my speed and stuck with my friend Kendra, who was fighting a stomach virus the night before, but opted to do the race as well. The chilly temps and the falling snow kept us at a very easy clip, and we finished the race in 2:19. This still afforded me enough time to get home, (literally) thaw out, and then head to the airport for my 1:30pm flight out of LaGuardia. 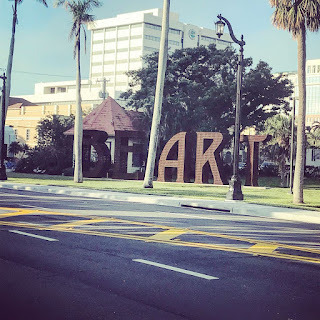 I had ended up booking my flights rather late, intending to keep it cheap by flying into the larger hub of New Orleans, about a two hour drive away. Thankfully, we had no real delays, and we were able to get out of the NYC and into New Orleans on time. 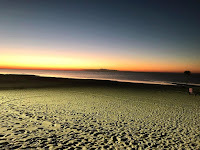 I drove to Biloxi as the sun was beginning to set, and in time to meet a couple other Marathon Maniacs for dinner at the Bacchus Seafood Restaurant on Biloxi Beach. 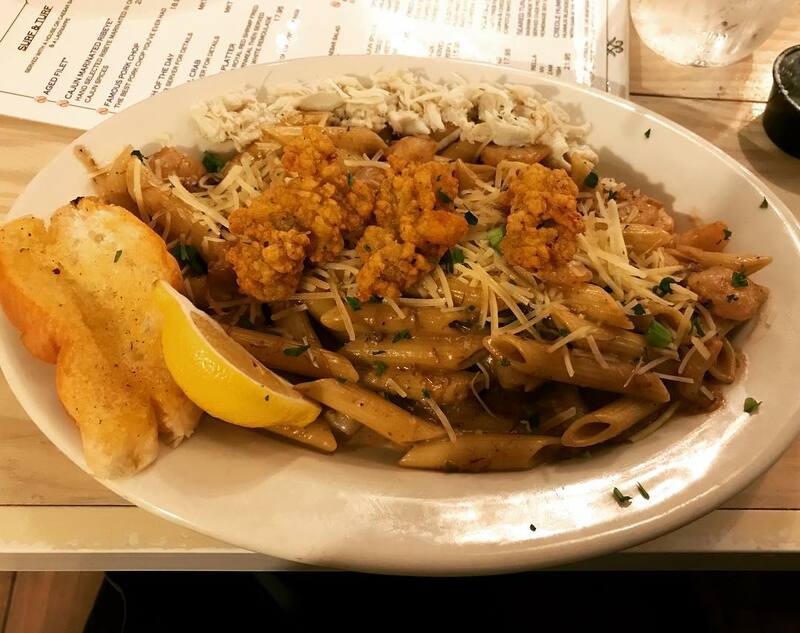 I had some delicious gumbo pasta, complete with gulf shrimp, okra, fresh crabmeat and fried oysters, a fitting way to carboload down in the Gulf Coast! I retired to my Airbnb that night, to get sleep before my early morning alarm. Mmmm... carboloading Gulf Coast style! The next morning, I was up quite early to get out the door and to the parking area near the MGM Stadium, home to minor league baseball team the Biloxi Shuckers of the Southern League, where buses were organized to drive runners to their respective starts - marathoners out just west of Pass Christian and half marathoners out to Gulfport. The 45 minute drive in the schoolbus was mostly spent asleep, though our bus driver seemed to get a little lost finding the start area; no worries, though, we found it and with lots of ample time. It was quite the chilly morning as well, so many of us opted to stay inside the bus to keep warm, until we absolutely had to be outside. 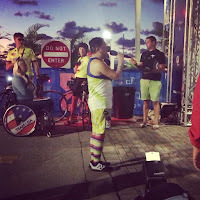 At about 7:45, I braved the cold and headed out to find Patrick, one of the race directors, out setting up the microphones, and introduced myself; about five minutes later, I sang the anthem to check off my 40th state and then we all rushed over to the start area on US Route 90/Beach Boulevard, huddled close together until the gun went off, as we aimed to elevate our core temperatures from our running. 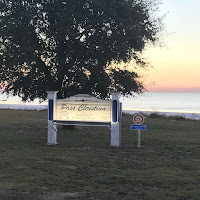 We set off from Henderson Point, then ran eastward into the city of Pass Christian, pronounced "Pass Chris-CHI-Ann", a charming beach town with diverse residential architecture, from Greek Revival to Creole to Victorian. 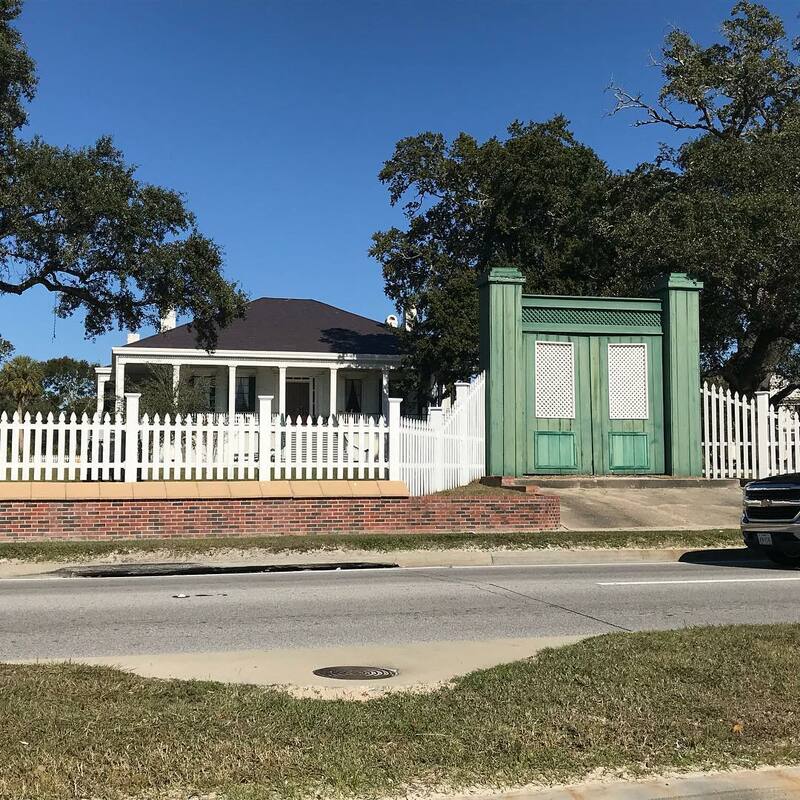 Over many decades, there have stood many gorgeous homes alongside beautiful live oaks that lined Scenic Drive looking out toward the Gulf of Mexico. 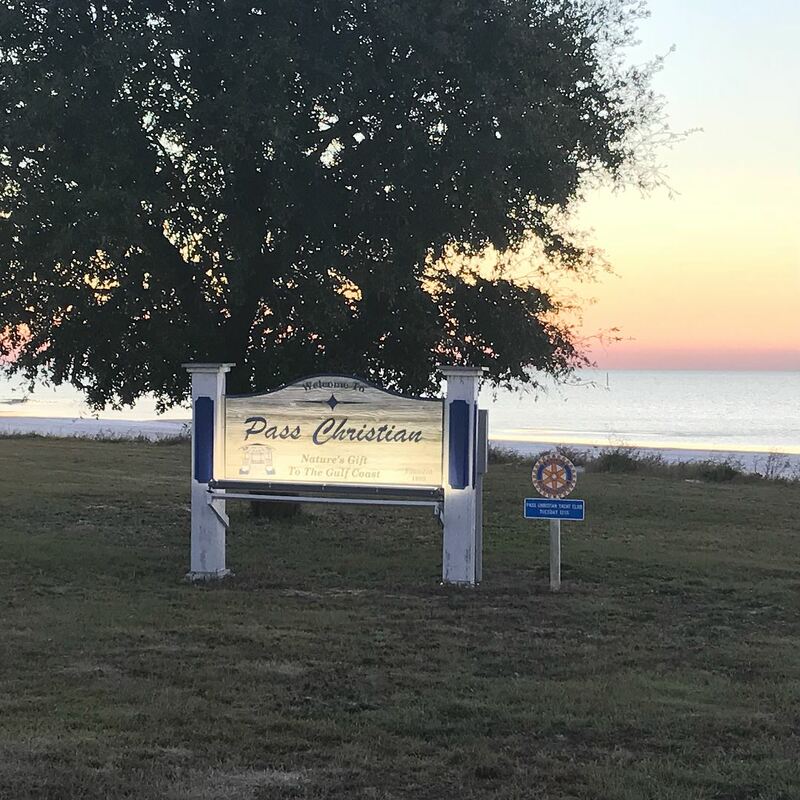 A little about Pass Christian: In 2005, this city along Mississippi's Gulf coast was almost completely destroyed by Hurricane Katrina. Of the approximately 8,000 homes in Pass Christian, all but 500 were damaged or destroyed. 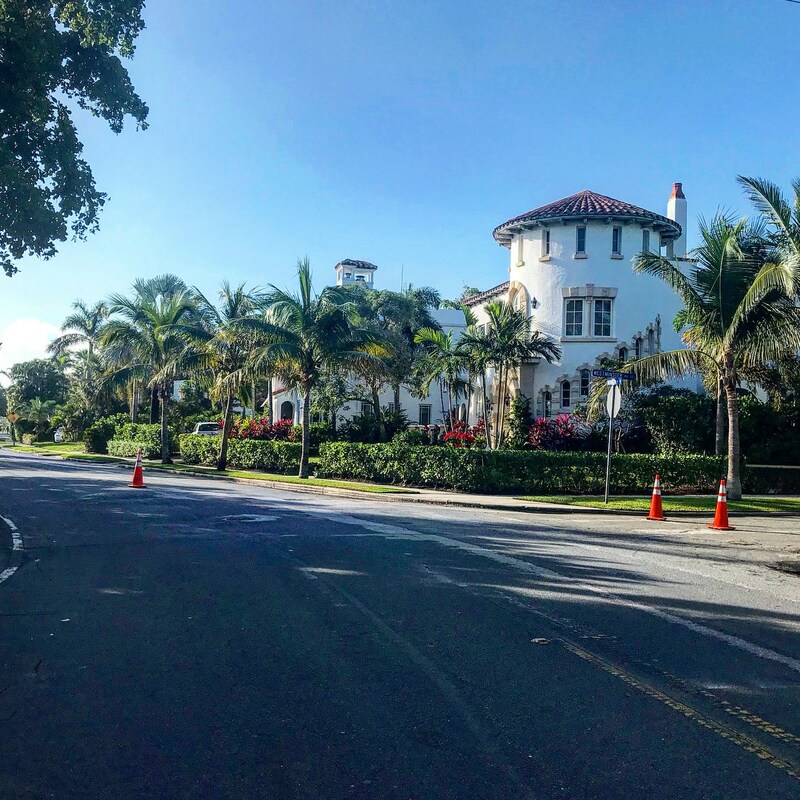 In spite of the fact that the beachfront Scenic Drive follows the crest of a small bluff, affording it some elevation, most of the historic mansions along the road were severely damaged, and many were completely destroyed. This was actually the second hurricane to directly hit the city; Hurricane Camille, the 2nd strongest hurricane of the 20th century, had almost totally destroyed it in 1969. Since Katrina, Pass Christian has slowly begun to show signs of recovery, with many buildings being rebuilt. 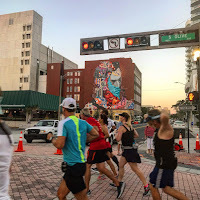 We ran eastward into Pass Christian, swerving to the left lightly onto Scenic Drive at roughly the two mile mark past the city's public library and later past War Memorial Park. It was around here when I met three friends from Charlotte, North Carolina, named Carlee, Lita, and Keith. 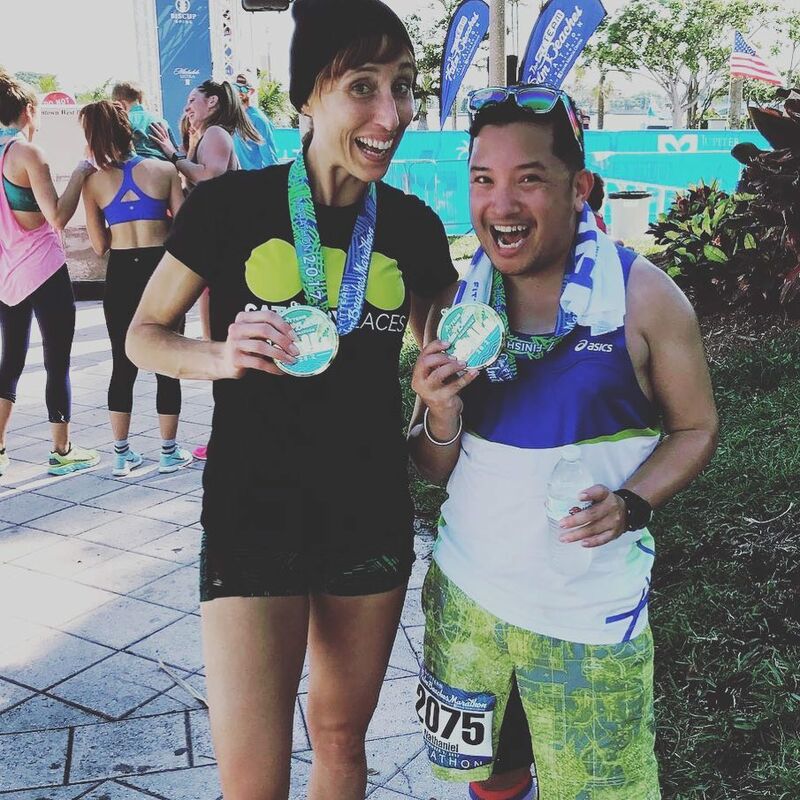 It was Carlee's first marathon, and Lita's second - and after chatting with them quickly, they soldiered on, as I began to slow down a bit. 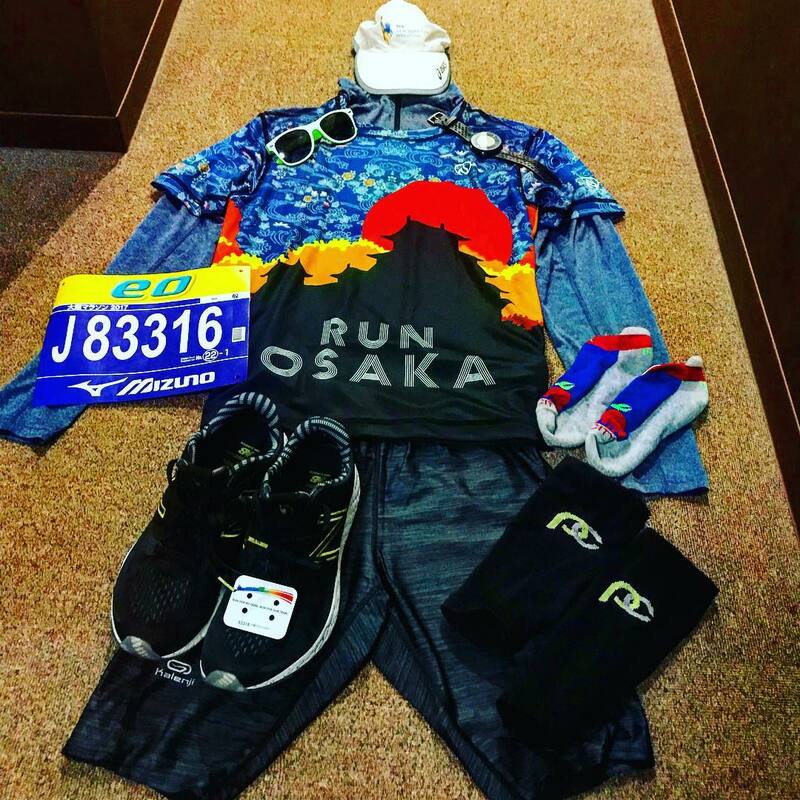 I began to realize how much this race was going to be a bit of a struggle for me, as my injured calf started to give me issues. Because I favored my left leg, I was compensating with putting more pressure on my right leg, causing my right ankle to feel terrible. 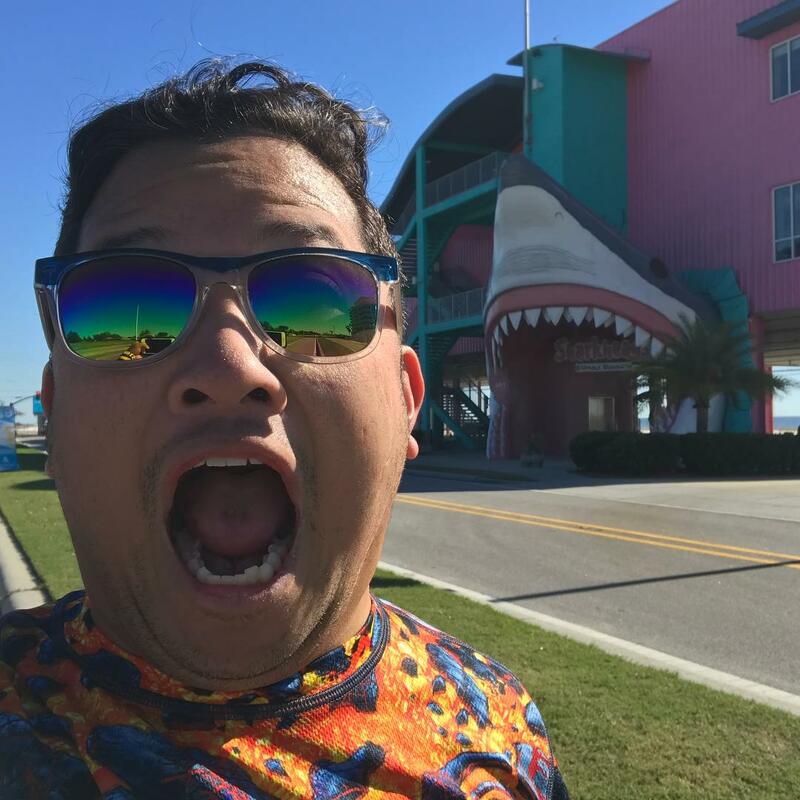 We returned to US Route 90/Beach Boulevard at around mile 4.5, and a mile and a half later, we entered the city of Long Beach, once known as the "Radish Capital of the World," another residential community like Pass Christian still recovering from Hurricane Katrina. We passed by Long Beach's marina and the Gulf Park campus of the University of Southern Mississippi, with its beach-facing side a patch of centuries-old oak trees, among them a 530-year-old southern live oak with a nearly 20 foot circumference called "Friendship Oak," which survived both Hurricanes Camille and Katrina. Since the 1950s, acorns from Friendship Oak have been gathered to produce seedlings for replanting along the Mississippi Gulf Coast to replace live oaks that were destroyed by both disastrous hurricanes. 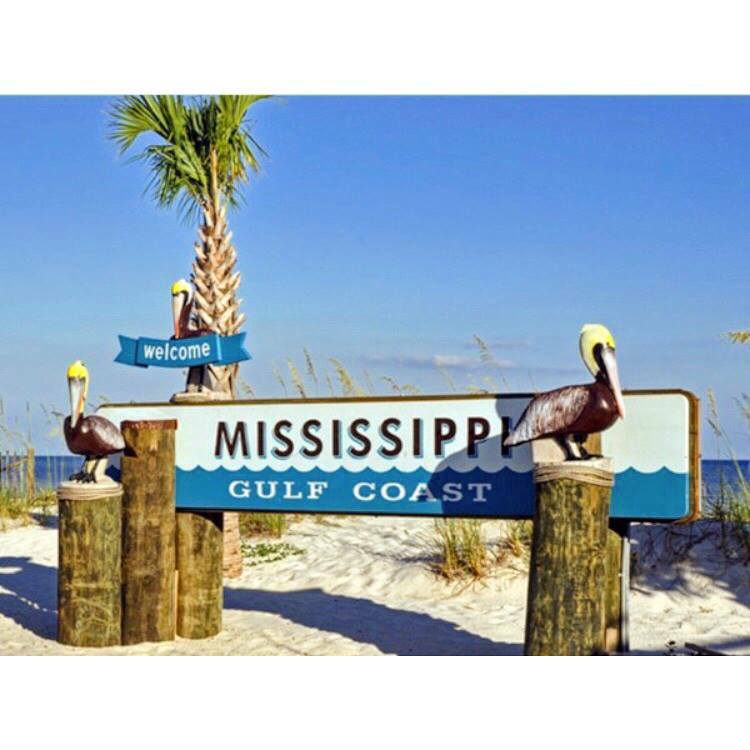 At mile 10, we entered Gulfport, the second largest city in the state of Mississippi after the capital, Jackson. From its beginnings as a lumber port, Gulfport evolved into quite the diversified city. 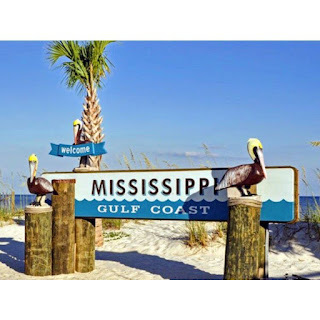 With about 6.7 miles of white sand beaches along the Gulf of Mexico, Gulfport has become a tourism destination, due in large part to Mississippi's coast casinos. As we continued east past its 115 year old harbor, a seaport that accounts for millions of dollars in annual sales and tax revenue for the state of Mississippi, we ran by its adjacent Jones Park and the municipal marina. 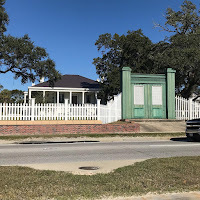 This park was named after entrepreneur Captain Joseph T. Jones, who co-founded the city of Gulfport and developed the seaport. After Katrina, the park, considered a signature facility for the city, was under 25 feet of floodwaters, and required $40 million to rebuild. Reopened to the public in 2012, it was decked out in holiday decorations during the day of the marathon, even on its replica lighthouse at the center of the park facing the water. This was also where the half marathoners began their race. We eventually hit the halfway point, and I clocked in the first half in about 2:30. I considered then about possibly having to walk the entire second half because of my pained ankle. I soldiered on forward, and at around mile 15, I ran into Carlee from early on in the race, who was having some difficulty herself - her friends had continued on, Lita en route to a potential PR. 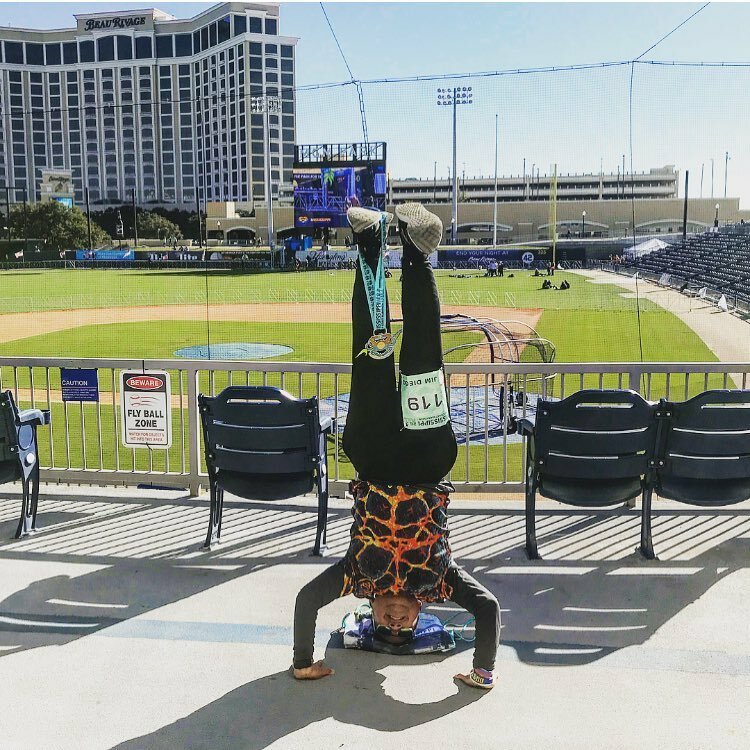 I decided to keep Carlee company, crossing over from Gulfport into Biloxi city limits a couple miles later, and keeping her mind off of the troubles one often feels in the second half of their first marathon. 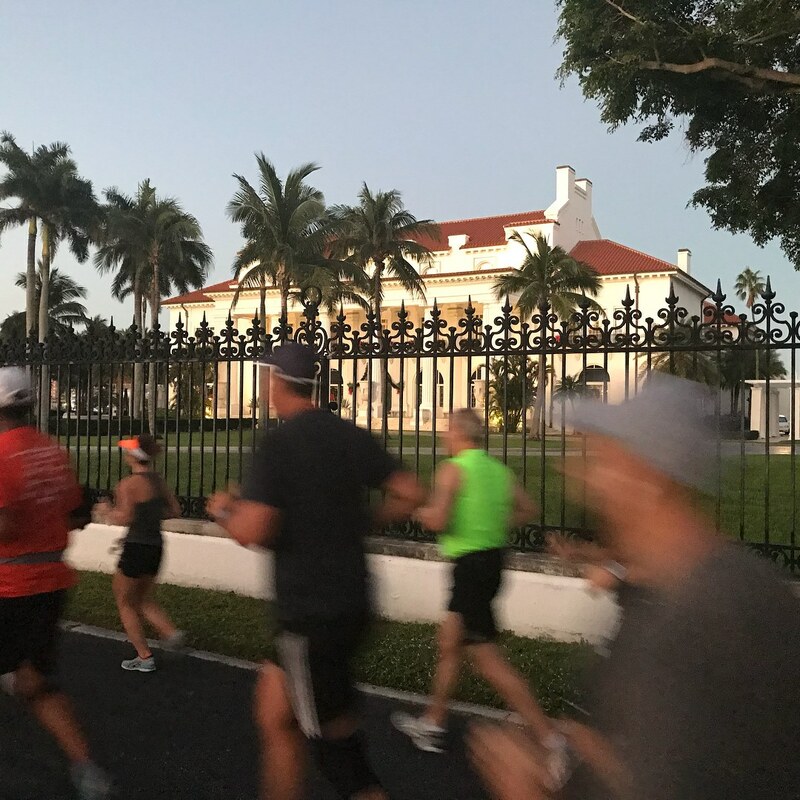 At mile 19.5, we ran by the green gates in front of Beauvoir, the historic postwar home of former president of the Confederate States of America, Jefferson Davis. Several buildings in the estate, in particular the main house, were destroyed by Hurricane Katrina, and it underwent extensive restoration for three years from 2005 to 2008. It is now reopened for visitors. 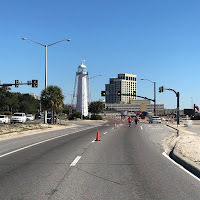 The closer we got to Biloxi, the more things there were to actually see during the race. 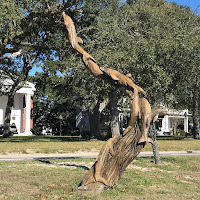 There used to be massive live oaks that lined US Route 90 along the gulf shore, but because of Hurricane Katrina, many of those old trees were felled due to the saltwater storm surge. 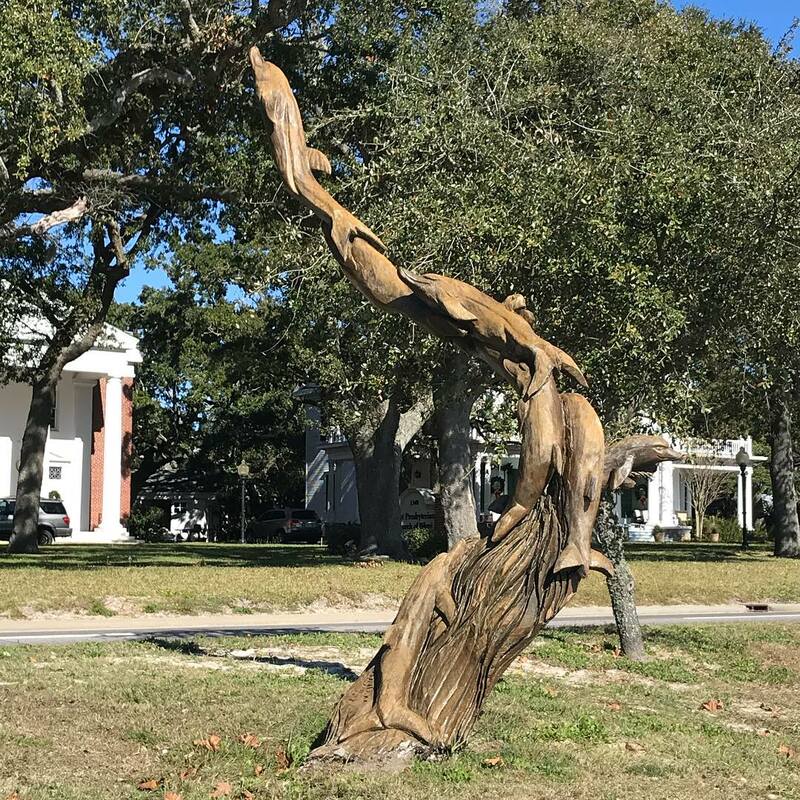 Artists were able to take the remaining tree trunks and create sculptures of marine life. 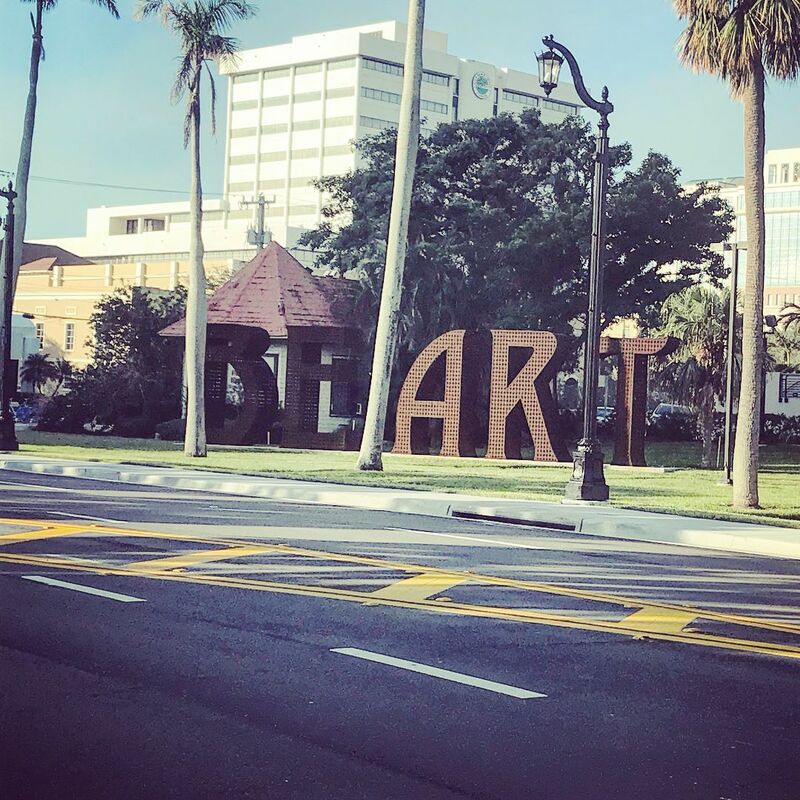 The renewed vision, created by wood sculptors brandishing chainsaws, high speed grinders, sanders, and chisels, gave these trees a second life, turning them into beautiful pieces of public art along the highway's center medians. As we got further into the city, buildings began to line the beach side of the highway. 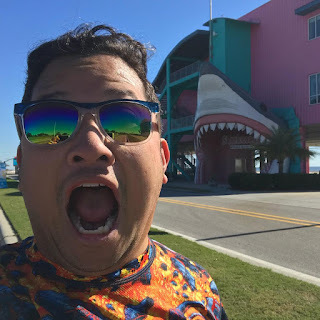 Notably one of these was a souvenir store called "Sharkheads" with a 32 foot tall giant shark mouth entrance. 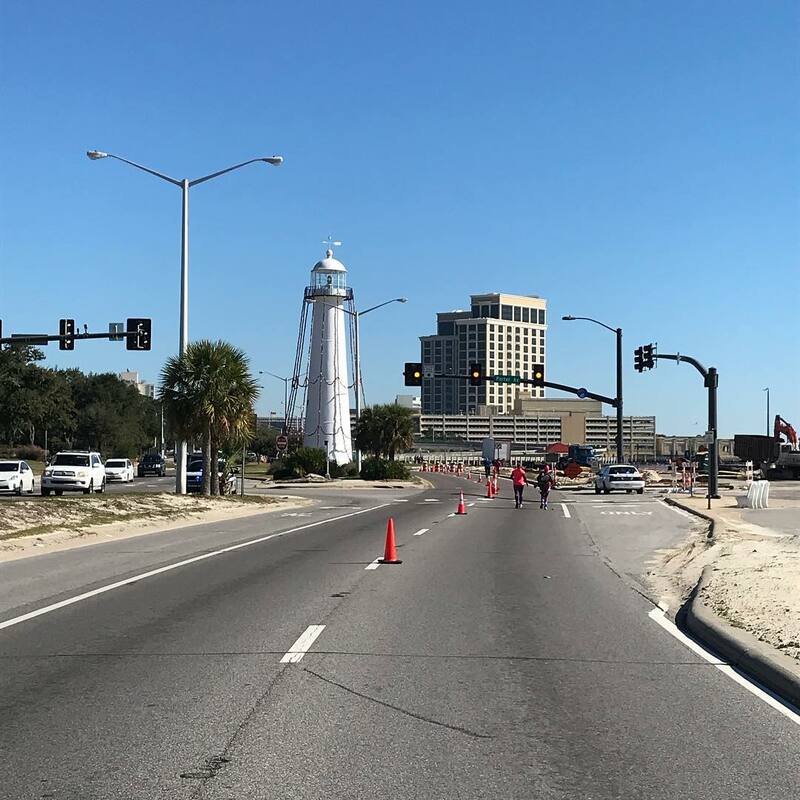 On our left was the Biloxi Lighthouse, completed in 1848, the only lighthouse in the US that stands in the middle of a four lane highway. Having survived Hurricane Katrina, it has been kept by female keepers for more years than any other lighthouse in the US. 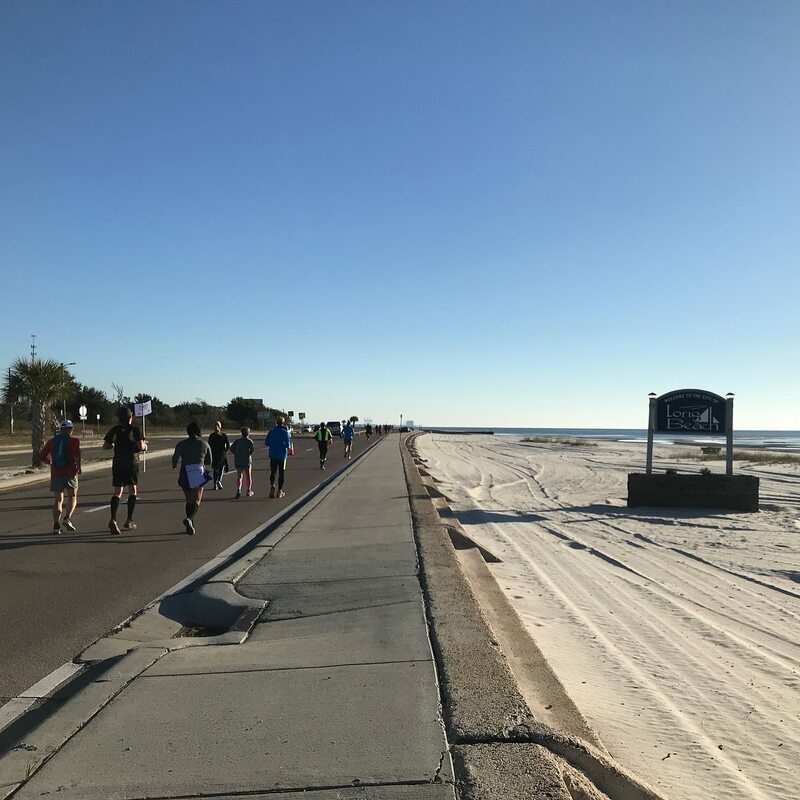 At the 24 mile mark, we ascended the looped ramp that took us onto I-110, where we would complete an out and back, before heading back down to Beach Boulevard. After coming down the ramp from the I-110 freeway spur, Carlee and I turned left onto Beach Boulevard, and came upon the final mile to the finish after passing my friend Brian along the road, who warned that his watch measured the course a bit short, before we made the turn onto Calliavet Street and then into MGM Stadium. 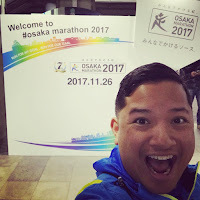 After passing through the stadium's entrance way, we made our way onto the field, where we made our way around the warmup track at the edge of the stadium all the way to the finish line, crossing together in 5:50. Carlee finished her first marathon, and I finished my 59th! Sure, my watch measured 25.77 miles, short by nearly half a mile, but I chalked it up to the weather messing with my GPS. I guessed, hmm - maybe Brian's showed that too. Carlee and I finishing the marathon! 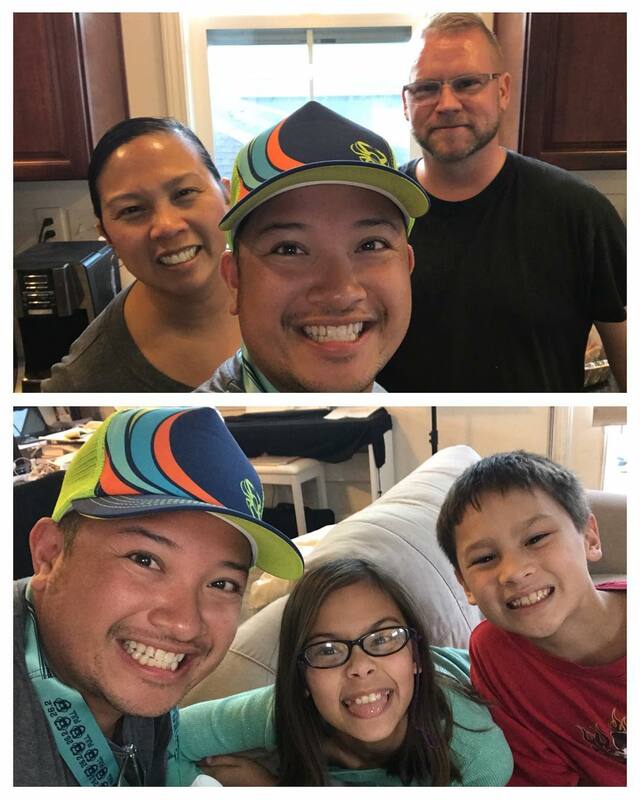 After much needed food and beer, my customary headstand photo, and a shower back at my Airbnb, I drove to New Orleans and got some time to see my cousin Chrissy, her husband Adrian, and their kids Lily and JD before heading to the airport for my flight home. It was a short visit, but at least I got it in since I was already in the area! 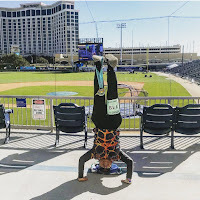 Victory Headstand in MGM Park! 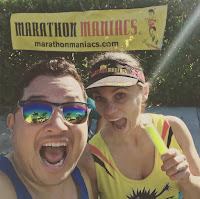 There were already murmuring online from people who had run the race and measured the course short with their watches - it wasn't only me and Brian who had watches that didn't register the full 26.2 Tuesday after the race, we got an email from the race directors apologizing the discrepancy and fully explaining what had happened. 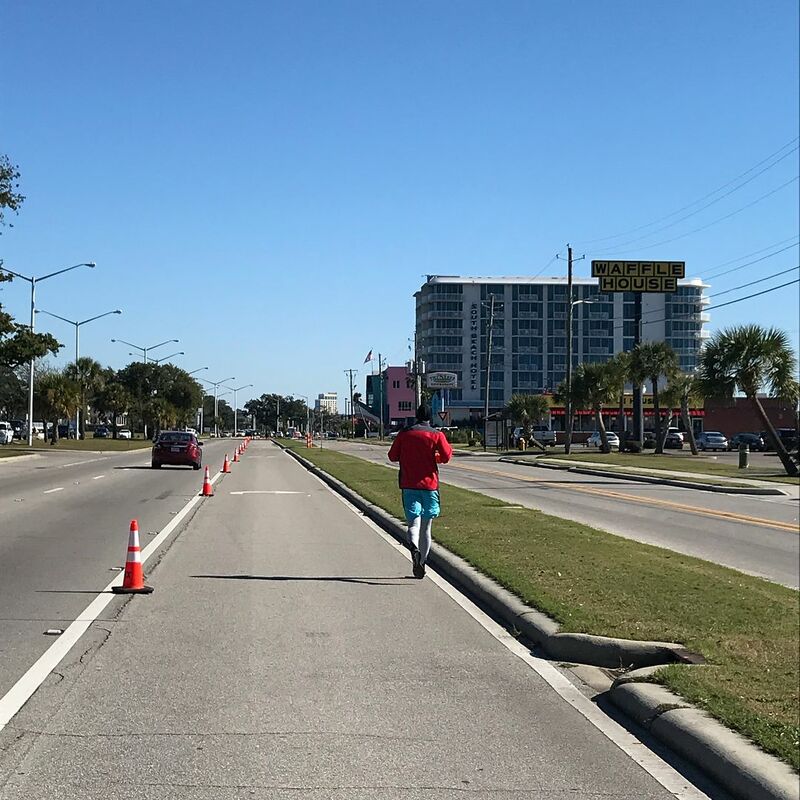 The course was certified and measured accurately, but on race morning, an orange cone was placed 147 meters short of where it was supposed to be (parallel to the second instead of third lamppost along the I-110 out and back) and it wasn’t until the race was over when it was figured out. "Here is an explanation of what happened: I personally measured the course to be submitted for certification. We had access to Interstate I-110 for only a couple hours early one Sunday morning to do so. This required police escorts and for the interstate to be partially closed. There was not enough time to measure that portion of the course two times and then make a third trip to measure and mark the turnarounds. The next time we would have access to be on the interstate would be race morning. Due to that, I measured and set marks at every light pole and interstate truss sign along that portion of the interstate. (These are all approximately 260 feet apart on average.) Once the final distance of the course was measured and verified, I had made enough marks to be able to set the turnaround(s) race morning and knew which marks to measure from for those turnarounds. The marathon turnaround was meant to be set 105' north of the interstate truss that is just south of Percy St. That is the third interstate truss sign you pass when heading north from Hwy 90. I instructed the person measuring and setting the turnaround to go 105' north of the second interstate truss mark. It was my absent mindedness that lead to communicating to that person incorrect instructions. Because of the measurement notes and verification that the turnaround was marked exactly per my instructions, I know that the marathon course was 1,555' 1" short. That is approximately .295 miles. 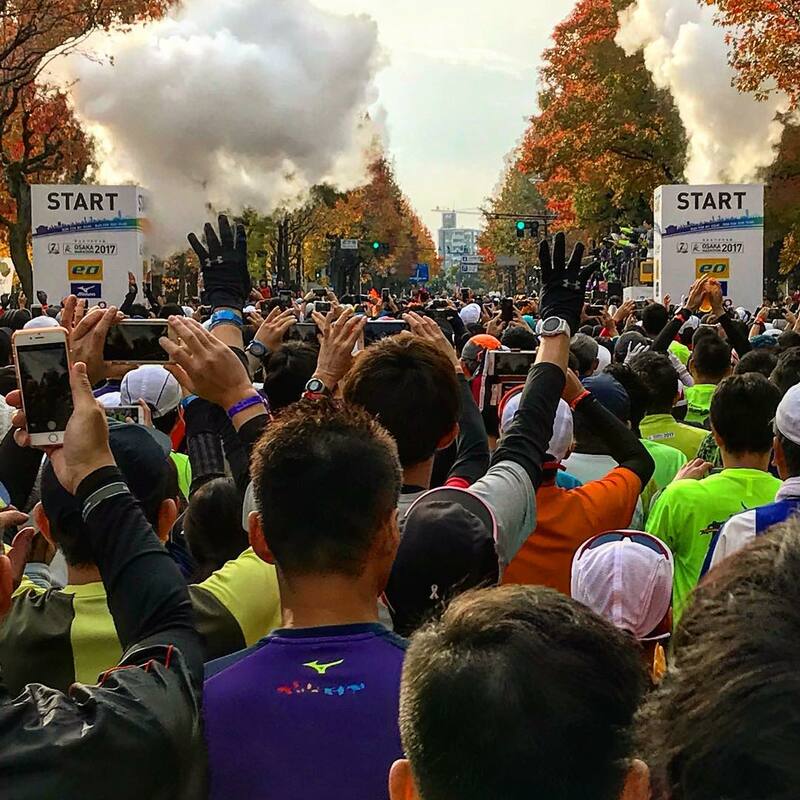 The half marathon was executed per certification and was correct." Of course, this was pretty devastating as this was a hard fought race to complete, and Mississippi was hard enough to get out to for people traveling in from out of state. 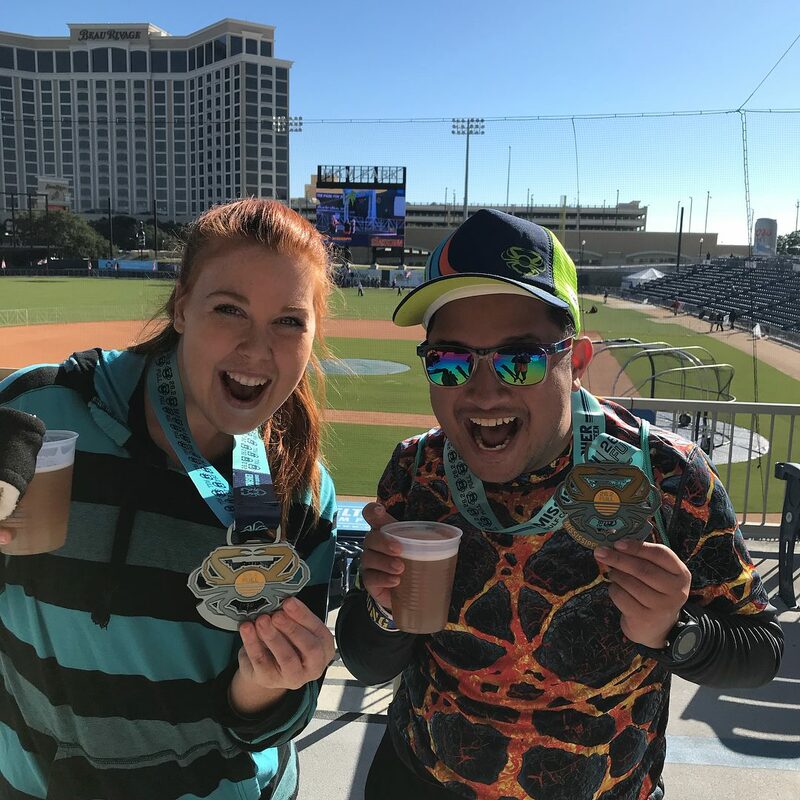 The RD was extremely apologetic and followed up with a resolution email offering a hefty discount to their Louisiana Marathon weekend of races the following month, as well as another resolution a few months later for a discount to the 2018 edition of the Mississippi Gulf Coast Marathon race (once dates and logistics were settled.) While the course shortage left a poor impression on this organization for many runners, they vowed to ensure that the course length would be heavily scrutinized for race morning the following year to ensure the complete length was covered. I, for one will still champion the races that they put on and all the efforts their team put in to create an awesome event for all participants and spectators. 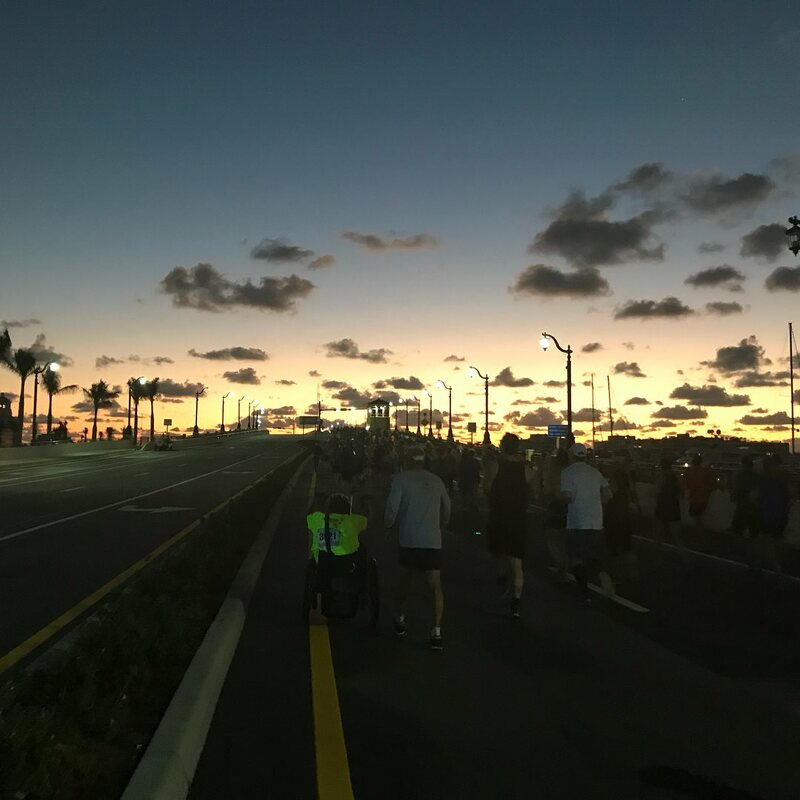 In early November 2017, I was able to book the national anthem at the start of the FitTeam Palm Beaches Marathon. 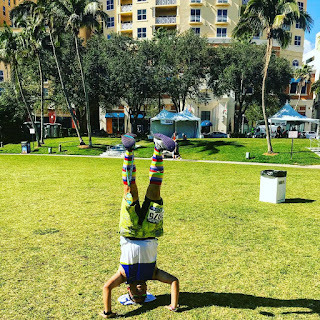 While I had already sang (at the start of the Key West Half in 2016) and run a full (the Miami Marathon earlier in 2017) in Florida, I ultimately added the race to help cap off a tremendous year of running, finishing a goal of 35 marathons in the 2017 calendar year. I would be headed to Florida only a few days after returning from Osaka. 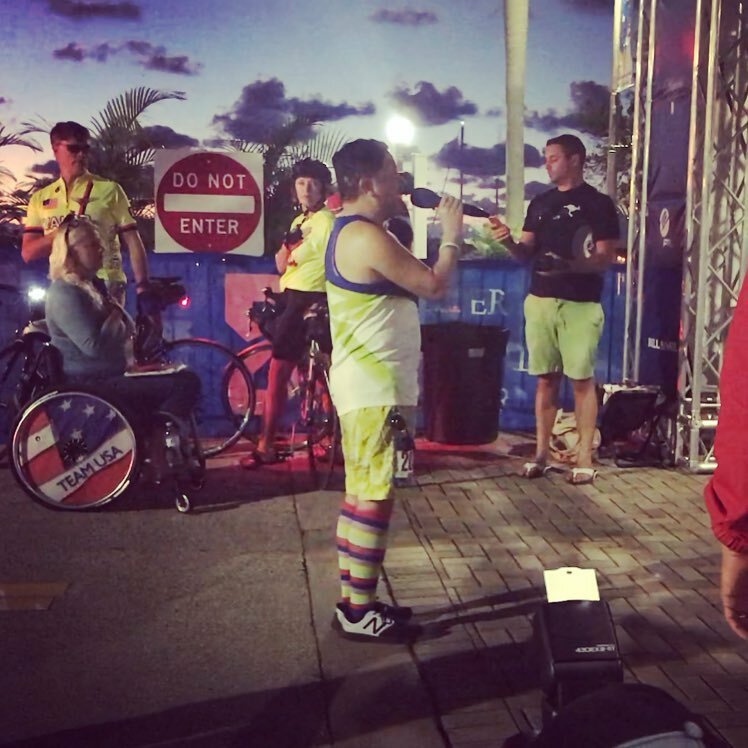 The marathon apparently was not run in the previous two years, but was brought back this year, culminating a three-day series of events that began Friday with a 5K with fireworks and a concert by rock band Sister Hazel. Under new management, K2 Sports Ventures bought the race and brought in Fitteam as the name sponsor. This superbly flat race, typical of those in Florida, would still test its runners not used to the heat and humidity of the area. I came in Friday night to Fort Lauderdale, right around the same time as my friend Andy who arrived at roughly the same time from Houston, as our friend Seth picked us up to stay at his place in Wilton Manors. 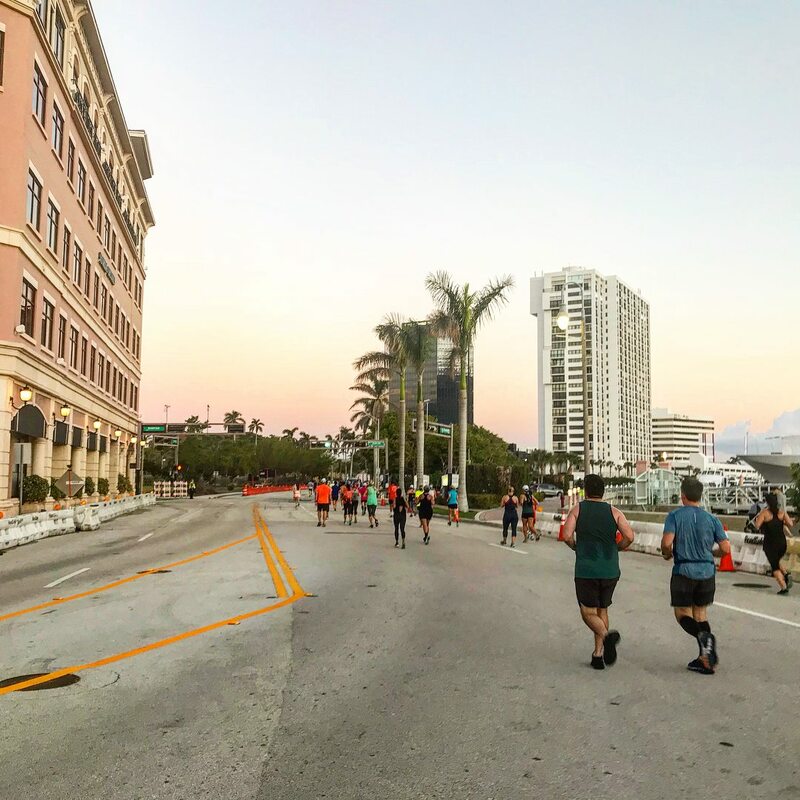 We headed into West Palm Beach on Saturday for the race expo, located at CityPlace, an upscale shopping center. A relatively small expo, we stayed in West Palm for a short period of time, opting to return to Fort Lauderdale for the rest of the day, lazing around. 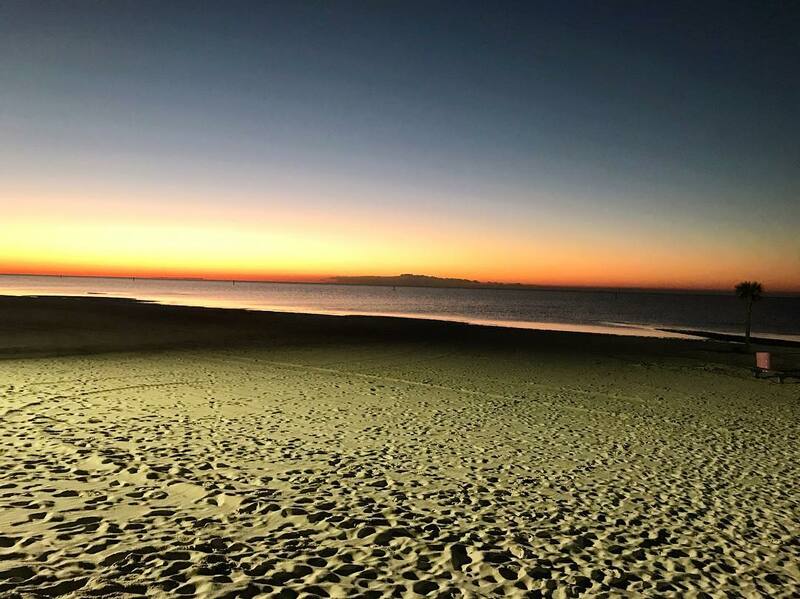 It was an early night because the race was going to be SUPER early the next morning, and we still had a 45 minute drive to get to the West Palm Beach. 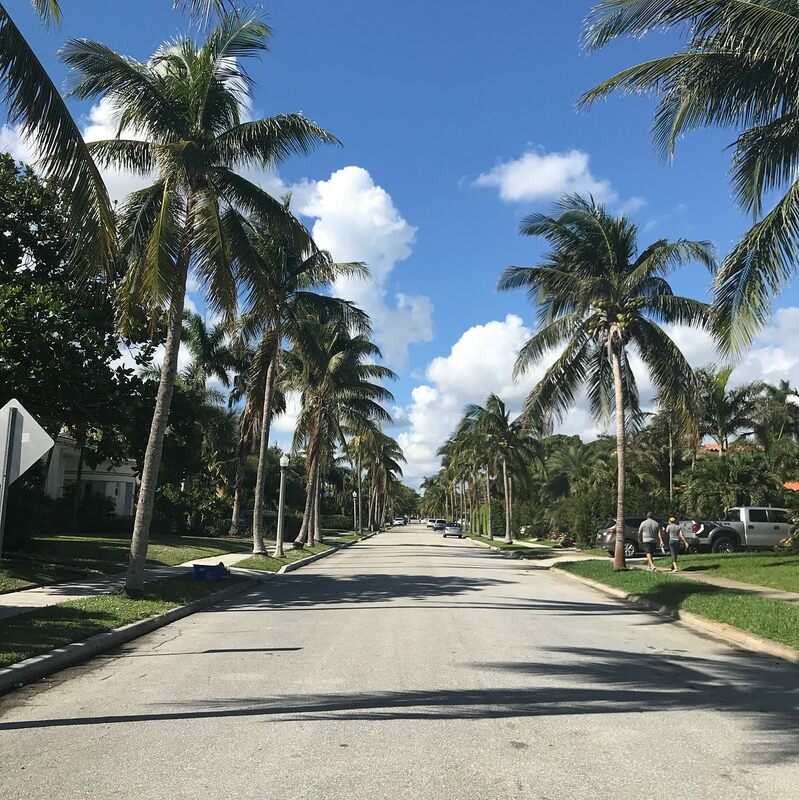 Waking up at 3:30/4am, we were out the door and headed to Palm Beach by 5, and found some convenient parking in a side street not far from the start area. It was pitch black outside, and the sun would not be rising for quite some time. The race was starting at 6:15. I got up to the startline to sing, right before rushing into the corrals to head off into the dark, heading north on the curved Flagler Drive, right alongside the Intracostal Waterway/Lake Worth Lagoon. Barely half a mile into our race, we were turning right already to go over the Flagler Memorial Bridge. 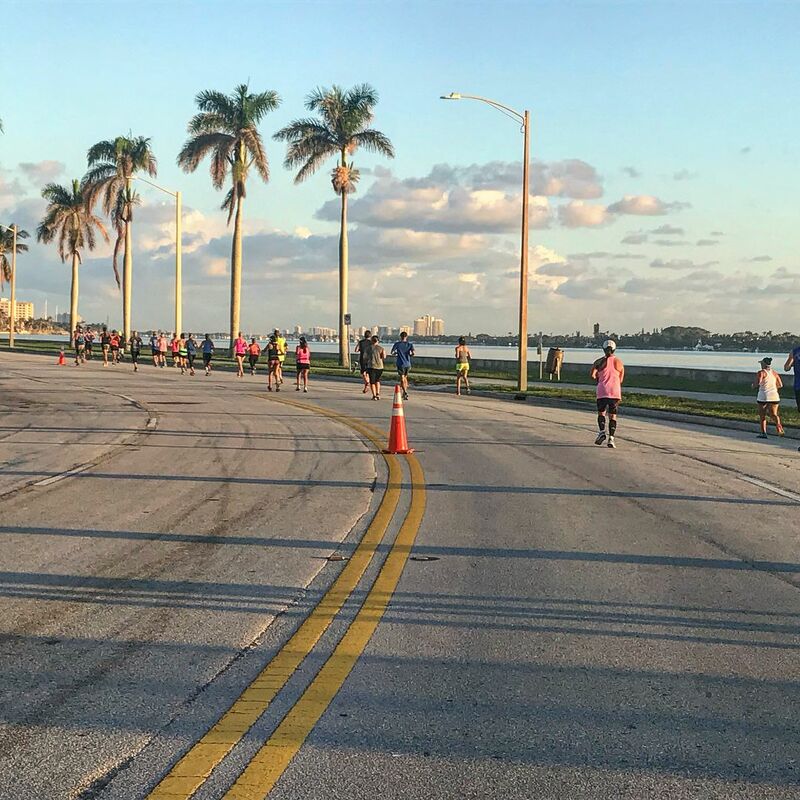 For the first time in race history, the course was going into the affluent town of Palm Beach. 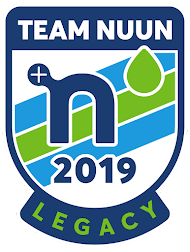 Initially scheduled to come at mile 3 and 4 of the race, the course was slightly amended the day before the race to counter the effects of the convergence of the setting supermoon and a King Tide potentially creating a flooding situation in the Lake Trail. The race directors decided to start the race 15 minutes later than scheduled, and moved the section within Palm Beach slightly earlier, to miles 1 and 2 of the race, in order to combat that potential flood threat, not to mention also being in and out of the Palm Beach area within a time that was agreeable to the police patrol in that community. 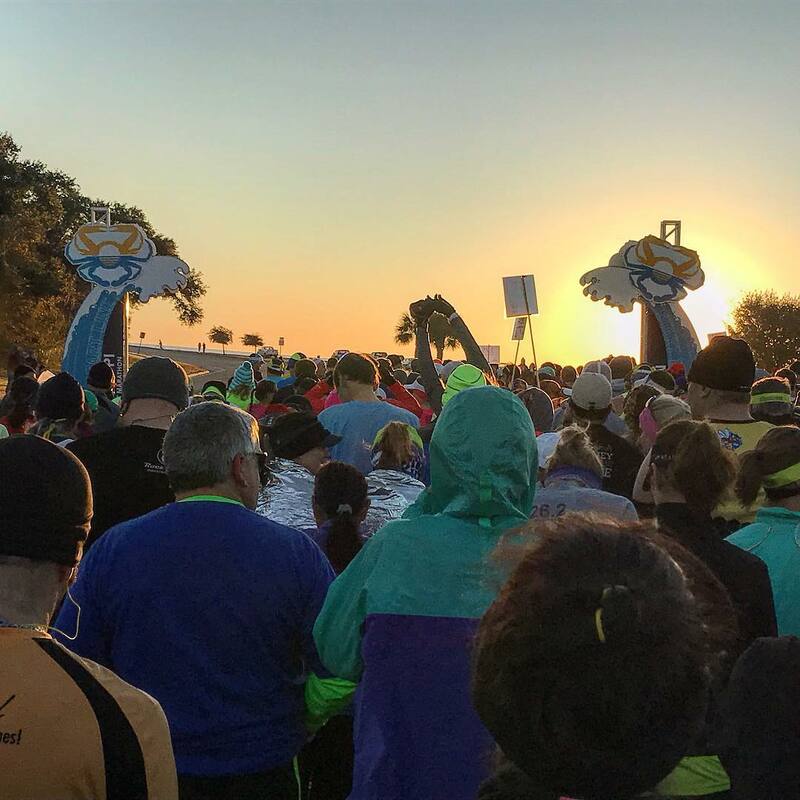 The tides turned out not to be a problem, and all of us runners were through that part of the course before 7am. After coming off the bridge, we turned left onto the sidewalk on Cocoanut Row past the Henry M. Flagler Museum (an Edwardian style 75-room mansion built in 1902 that was the home of Henry Flagler, one of the founders of Standard Oil and a leading developer of Florida as a tourist destination) and the 187-year-old giant kapok tree on the grounds of the Royal Poinciana Chapel, before continuing along the Lake Trail. You could see the water coming perilously close to the trail, but thankfully not affecting our run. 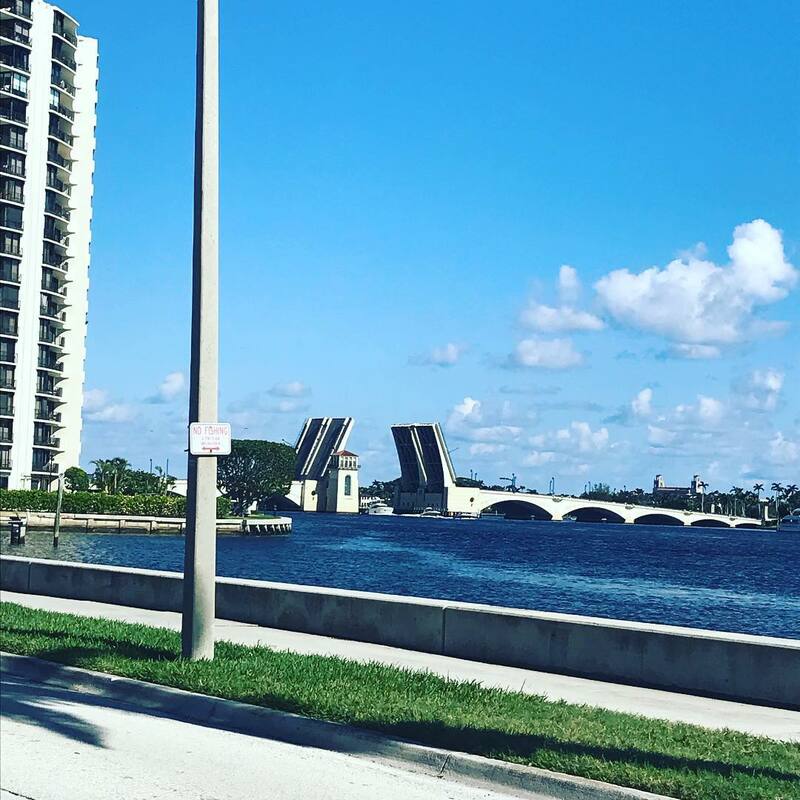 Before long, we were turning right onto the Royal Park Bridge, returning to West Palm Beach. We then came back on Flagler Drive, eventually running right past the start (and finish line), the second of four times we'd be passing through this area. 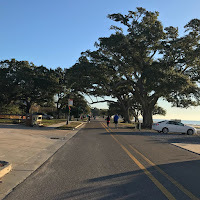 We turned right onto 4th Street, then ran down Olive Avenue for about 3/4 mile, before turning right onto Lakeview Avenue, then beginning a 3/4 mile northward trek along Quadrille Boulevard. 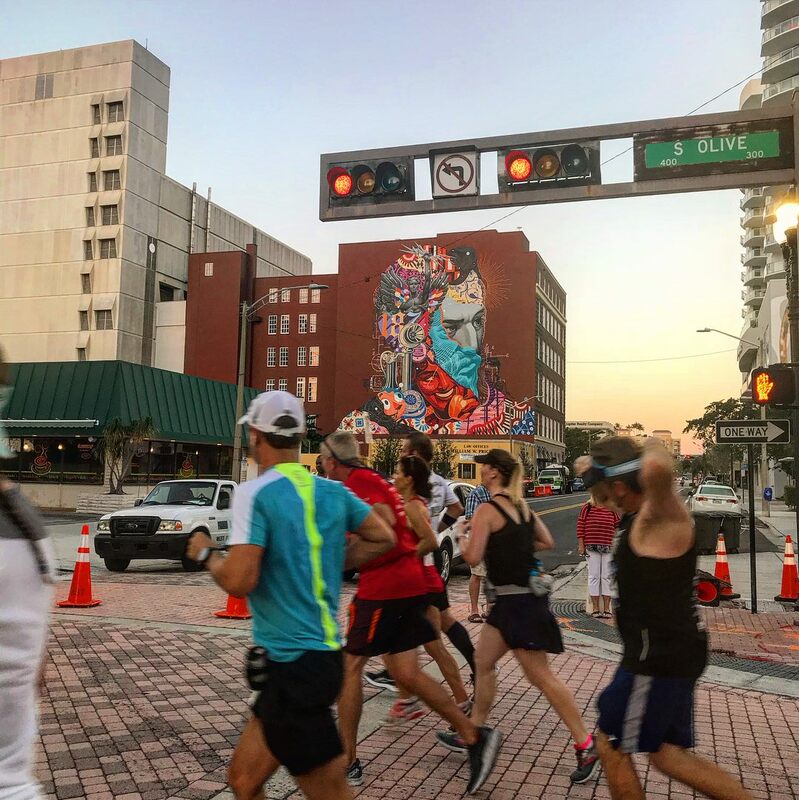 We were getting a zig-zaglike view of West Palm Beach's nondescript downtown, but got to admire the mixture of colors - not only the pastels that scream Florida coast, but also vibrant street art murals against buildings. 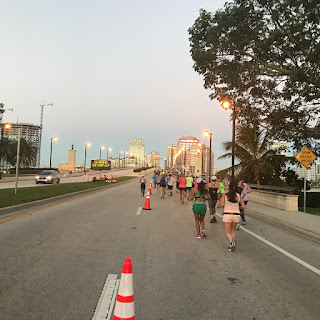 Quadrille Boulevard curved eastward back toward the Intracostal Waterway, with the Flagler Memorial Bridge in front of us once again, but this time, we turned left onto Flagler Drive (again), now five miles into the race. Ahead, we were now on our long northward trek, an out and back to take us to the northernmost border of West Palm Beach in the neighborhood of Pinewood Park, where we would loop around the parking lot of Manatee Lagoon, a tourist attraction where manatees huddle in the warm water outflows of the Florida Power & Light Company’s (FPL) Riviera Beach Next Generation Clean Energy Center gas plant during manatee season. It was fun seeing some friends along the way on their way back south as we headed out north toward the turnaround point. 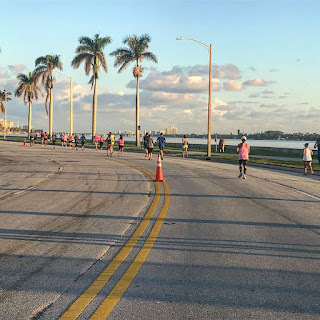 Just as I had made it past the turnaround point in the Manatee Lagoon parking lot, as we were heading south I could see thick black smoke rising into the sky in the distance, seemingly not far from the race course. It turns out, there was an explosion at a house on Lakeside Court near Good Samaritan Medical Center, barely a block from the race course. We had ran past this street at the 6 mile mark, and would eventually pass it again. Luckily no one was injured, but unfortunately the house was completely destroyed by the resulting fire. 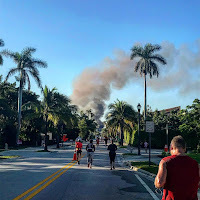 As I came back past the street at around 11.25 miles in (which was obviously closed off for the firetrucks to attend to the situation,) we could smell the smoky air. Seeing the smoke billow into the blue sky definitely caused a lot of concern for the runners as we ran towards and past the site of the fire. To make things worse, even as we had passed the street, the haziness from the smoke and its smell had drifted over to the finish line area where half marathoners were finishing their race, and marathoners were continuing -- still smelling pungent up to the 14th mile of the marathon. 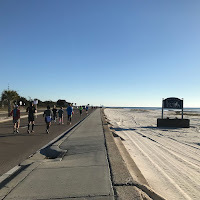 Shortly after passing the start/finish line for the third time, we came upon the curve near the Cove Islands just off the coast in the Intracostal Waterway, and race marshals directed us toward the pathway that took us underneath the Royal Park Bridge. 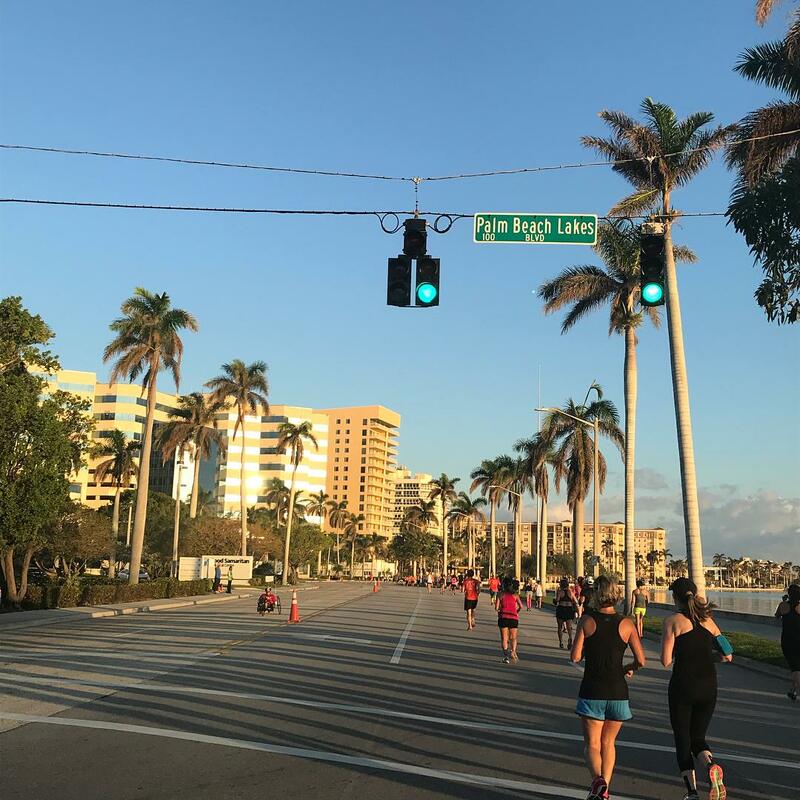 We'd reappear on the other side, and continue running on Flagler Drive, but it was MUCH more lonely out here, far fewer runners taking on the marathon distance. 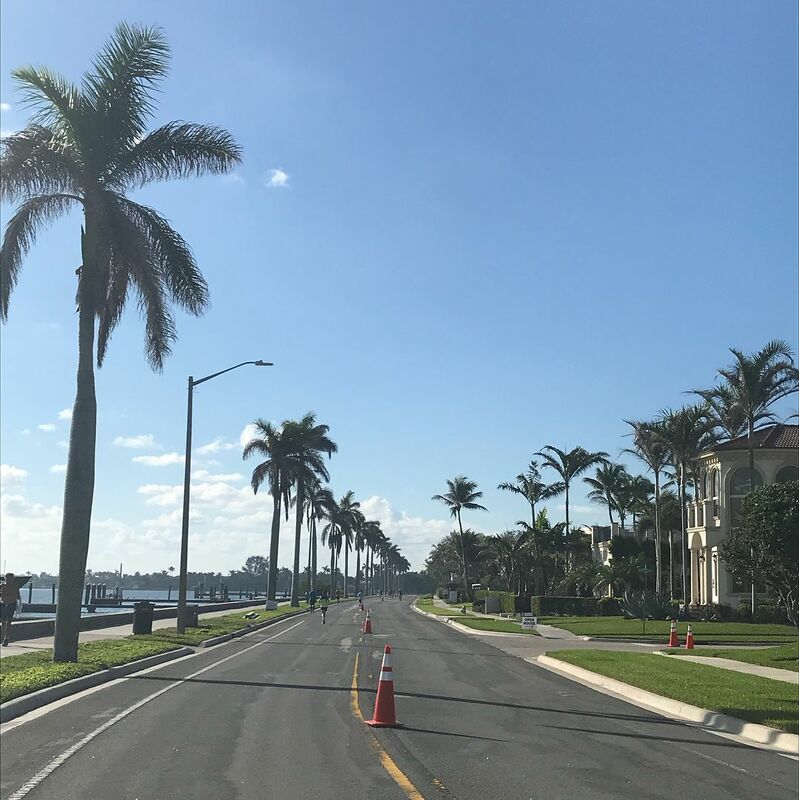 We passed the small campus of Palm Beach Atlantic University, as Flagler Drive became Washington Road, heading past some truly massive million dollar homes facing the water. Thanks for the treats, Heather! 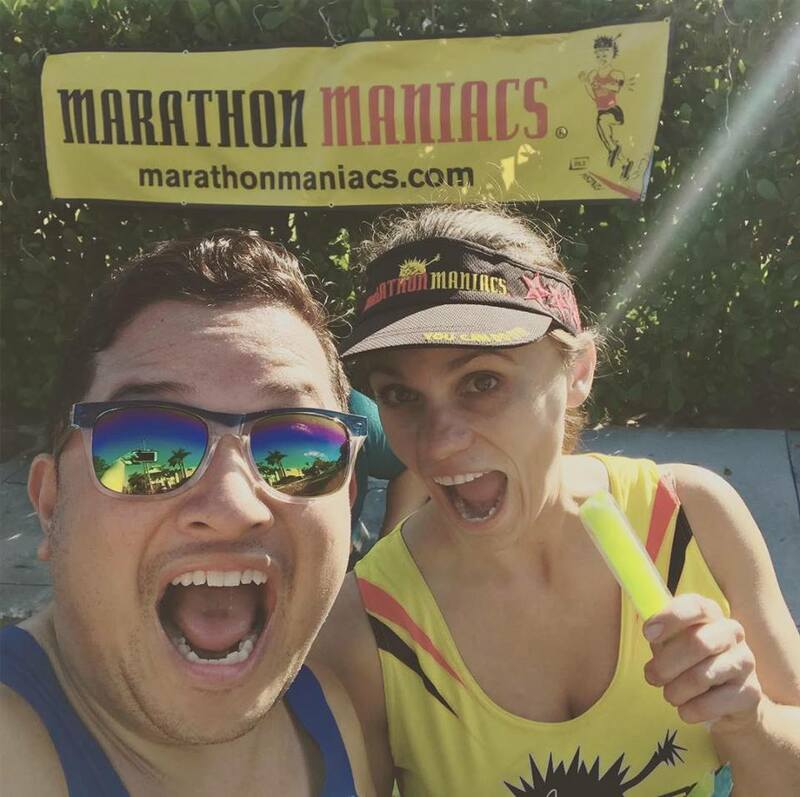 It’s always good to see friends-slash-fellow Marathon Maniacs cheering along the course! South Florida local Heather positioned herself on the course at mile 15, just south of Southern Boulevard (later, the 23.5 mile mark) handing out cold snacks among other things for marathoners! She was a much appreciated sight along the way. The sun was baking us like crazy by this time, coming upon three hours into the race - and it showed with my speed as my mile pace slowed by 2-3 minutes for the remainder of the second half of the race. 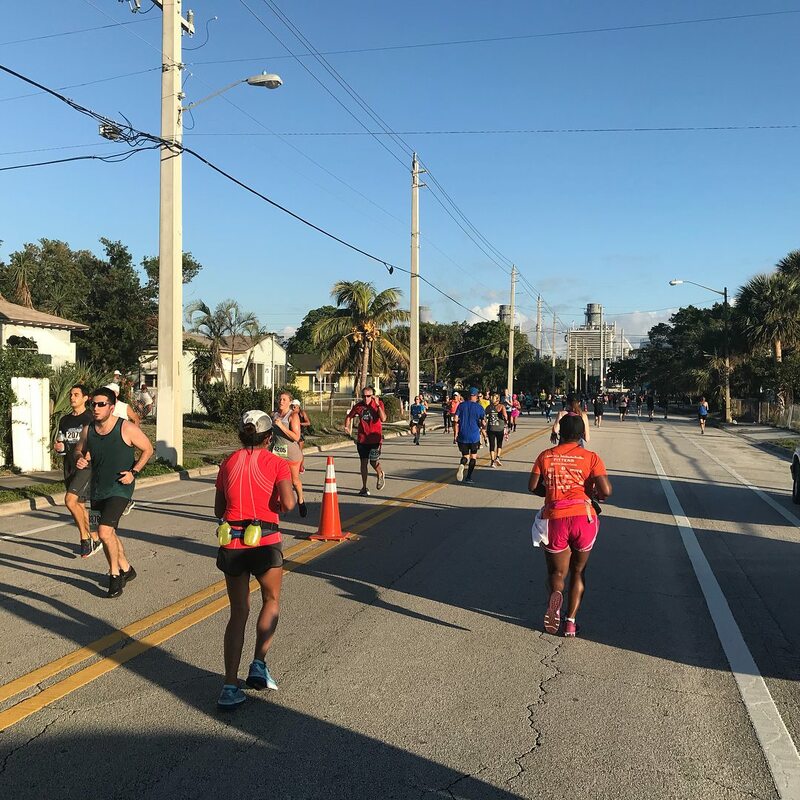 Some of the faster runners began to come back up toward the finish line in the other direction - one of those being my friend and fellow Team Nuun member Charisse from Orlando, who was vying for a podium placement among the women! 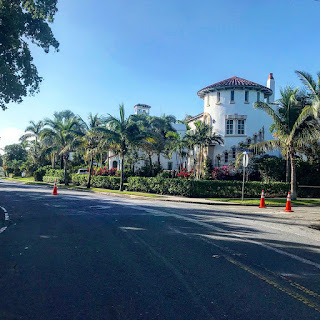 The road dead ended at Worth Street, as we turned left, and came back upon Flagler Drive once again, where we continued to work our way southward for the next 1.5 miles. The monotony of the views began to get at me, as we finally reached a right turn onto Summa Street, which began a short dogleg on the course as we wound our way through the residential Southside neighborhood of West Palm Beach. Eventually we found our way headed down Federal Highway for a short period of time with runners coming up the other direction. On the other side of the street, I saw a group of ladies cheering on marathoners at my mile 18 mark, shaded by some roadside trees. I yelled to them across the street to make sure they had a mimosa ready for me on the way back. 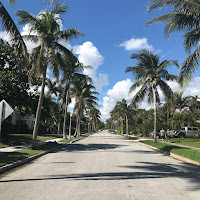 As I continued down Federal Highway, we crossed a small waterway and made our way into the neighboring city of Lake Worth. There was a bit of construction we had to deal with running through, but it didn't affect us much. 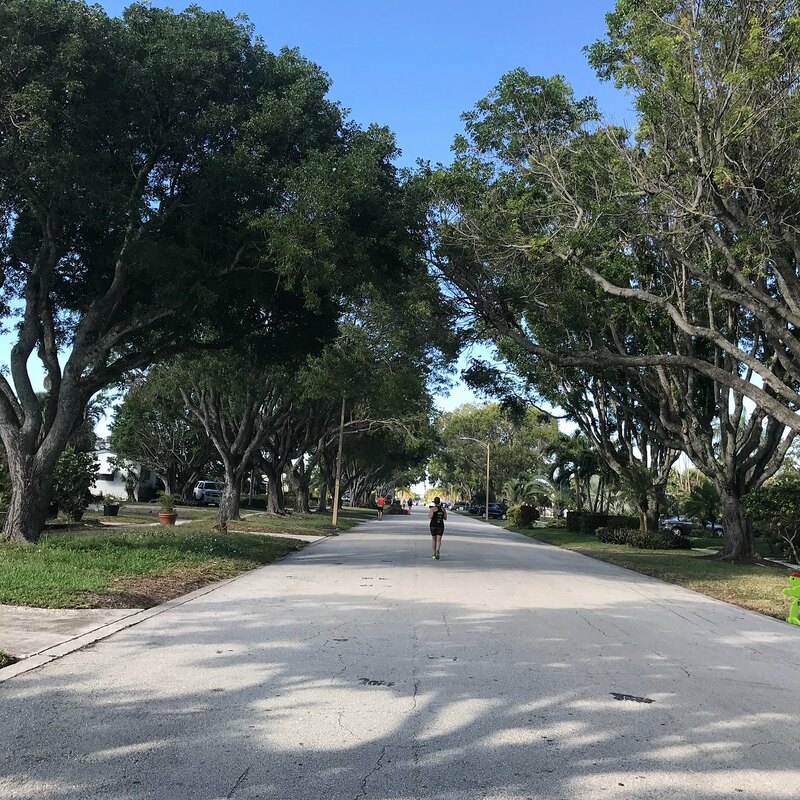 Our time in Lake Worth was short - we basically did one large roughly 3 mile loop around its quiet residential streets. 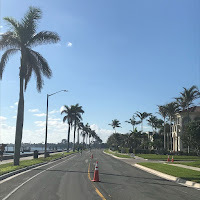 Just after crossing the waterway, we turned left onto Duke Drive, then began a southward route on Lakeside Drive, turning onto 10th Avenue, and back onto Federal Highway. 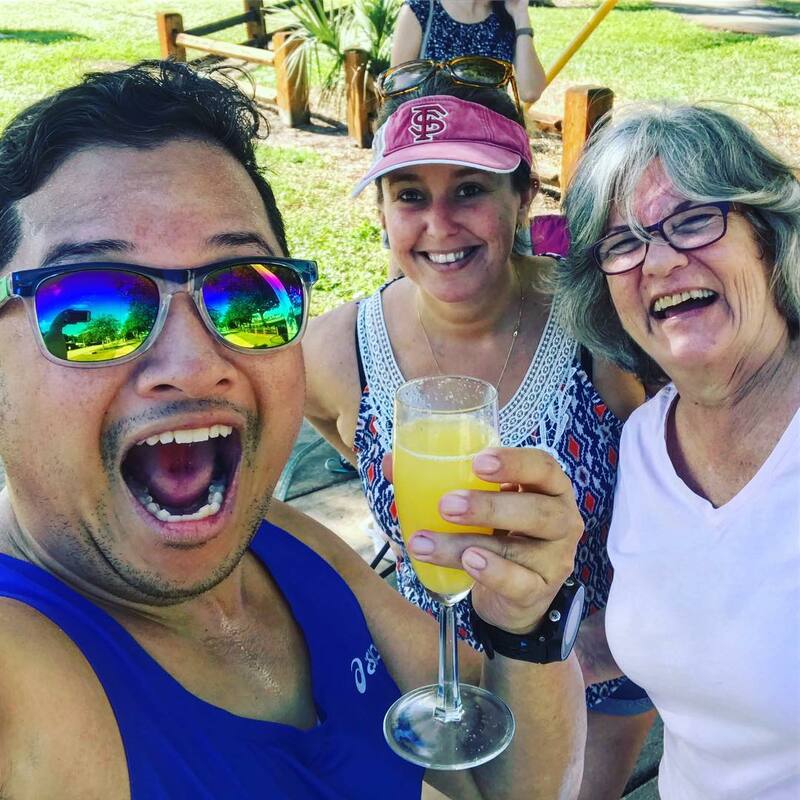 As we returned into West Palm Beach, the ladies cheering on the marathoners at the side of the road had kept their word about fixing me up a drink - sure enough, 3.5 miles later at mile 21.5, they had one waiting for me. I love fun spectators! The route continued straight northward as Federal Highway turned into Olive Street, the heat and humidity taking a toll on me. Eventually, I came back to Heather as the road joined back up to Washington Street for a much needed bit of refreshment. 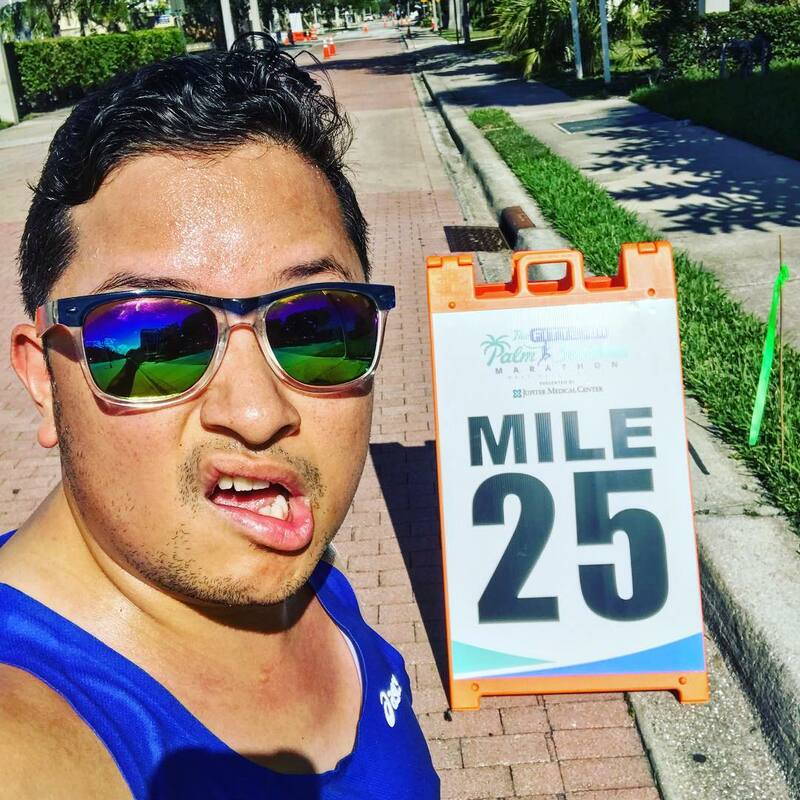 With less than three miles left to go, and my pace reduced to slogging through 14 minute miles, I resigned myself to the fact that I would be finishing well over my 5 hour goal. The route turned back toward Olive Street as we headed northward, eventually returning to Flagler Drive with a mile to the finish. 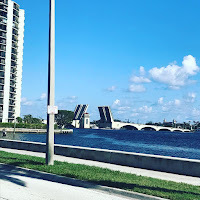 As we approached the recognizable buildings in the downtown, I noticed in the distance the double-leaf bascule of the Royal Park Bridge open for marine traffic as I passed, headed toward the finish. 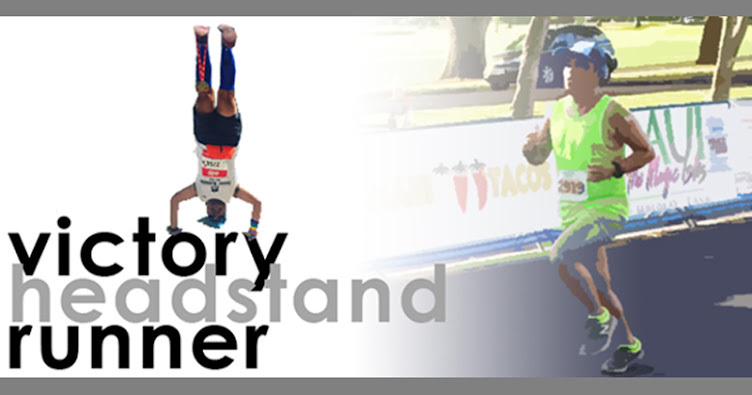 The heat and humidity, plus my tired left calf muscle (likely smarting from the hills of the Flying Monkey Marathon in Tennessee and crazy travel to Asia and back only days before) all compounded into a truly tough day on the roads, and I crossed the finish line in 5:27:09. Charisse, who did end up podium finishing as the 3rd overall female, stuck around for me when I finished the marathon, even though I finished around two hours after she did... After grabbing some quick shade and spotting my friends Andy (who decided to cut back down to the half after having a rough day on the roads) and Seth, I grabbed a quick headstand photo before we rushed to the car since Andy had scheduled an afternoon flight to head back to Houston. My flight was not til later that night, so after a well deserved nap and some food later in the day, Seth took me back to the airport for my flight back home. 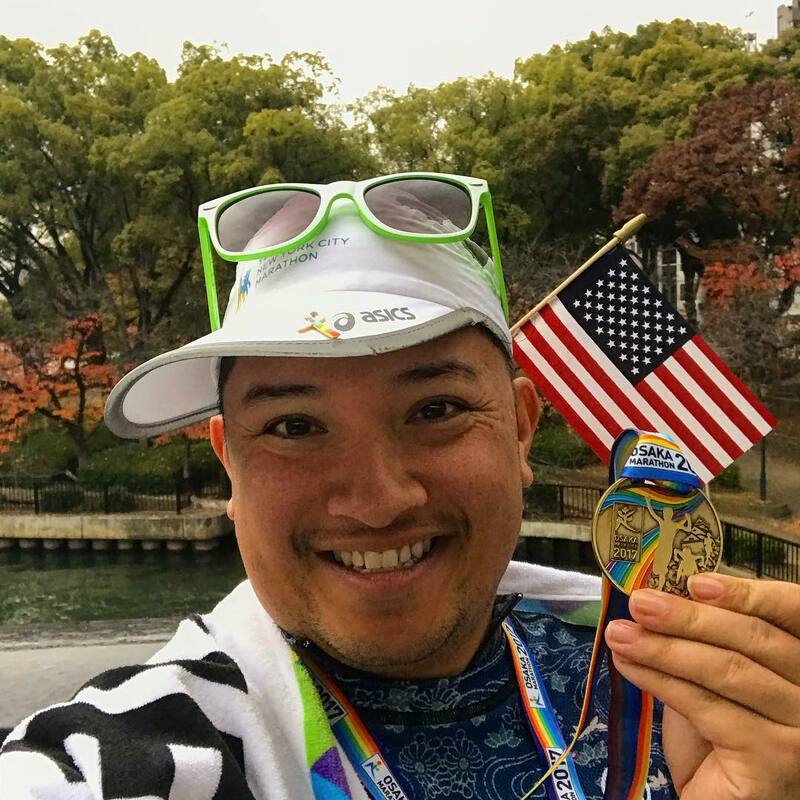 It was a tough finish, but I managed to complete my 34th marathon of the year! I'll be honest - it wasn't the most memorable race, and the course isn't the most impressive; but its flatness can bring in some good times if you're healthy and manage to stick it to the heat and humidity. 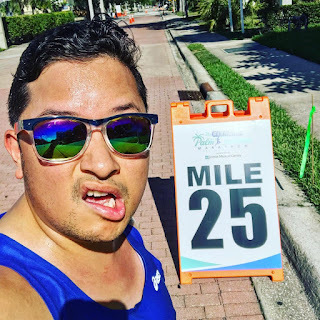 Mile 25 selfie... a tradition! Victory Headstand before we go! 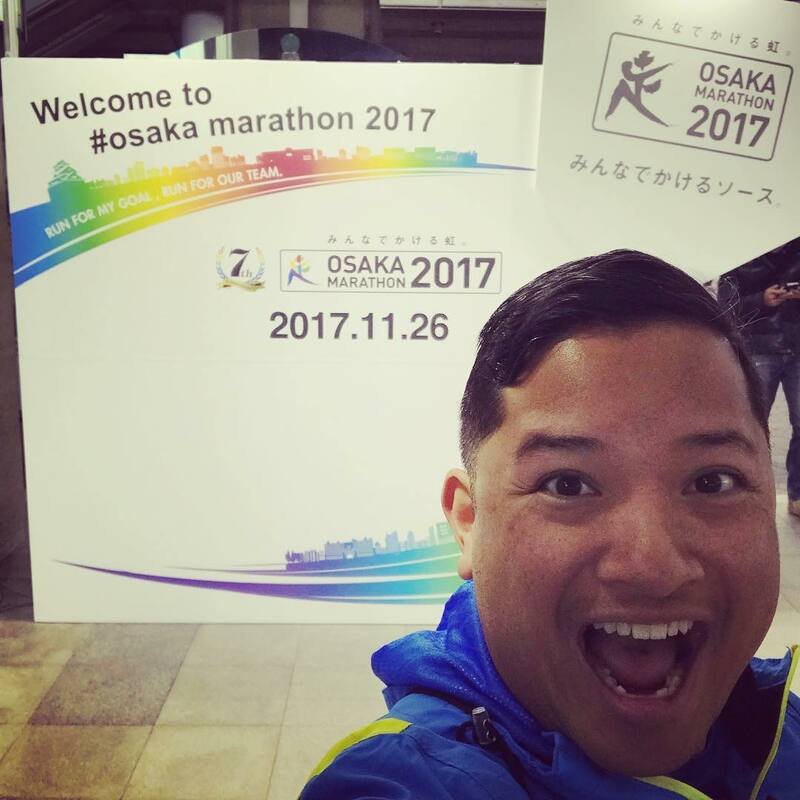 On a whim, I put my name into the mix for a lottery spot in the Osaka Marathon in April 2017, which would occur over the US' Thanksgiving weekend. I usually try to find an international race to run this weekend, which provides me two holidays on the fourth Thursday and Friday of that month. Two months later, I found out I was accepted into the race! Fast forward to November, and I'm headed to Asia for the second time that year. I decide to extend the long weekend by an additional two days, spending a couple nights in Seoul as well. Wednesday night after work, I head to JFK Airport and lounge around at the airport for a few hours before my flight, leaving near 1AM - a whopping 14 hour flight from New York City JFK to Seoul Incheon Airport. I did pretty well for the long flight, sitting comfortably in Korean Air Lines' economy class, one of the better economy classes amongst the world's airlines. We arrived in Seoul 4am, literally the first people arriving in the airport for the day. While I make my way through the terminal and with barely any wait in connections, I head to the KAL Prestige Class lounge (thanks to my status with Delta), and catch some z's before my flight to Osaka, which wouldn't leave for another four hours. The Seoul to Osaka flight was quick, only in the air for about 1.5 hours, and after landing at Kansai International Airport. It's an airport I've always wanted to visit, after learning about its controversial construction; while lauded for its innovative sliding joints technology, built to withstand earthquakes such as the 6.9 earthquake in nearby Kobe in 1995, the artificial island it was built on (which was expected to sink due to the weight of the material used for construction compressing the seabed) sank much more than anticipated, becoming the most expensive civil works project in modern history after twenty years of planning, three years of construction and $15 billion US dollars of investment. Not only that, it has the longest single airport terminal in the world, a total of 1.1 miles from one end to the other. 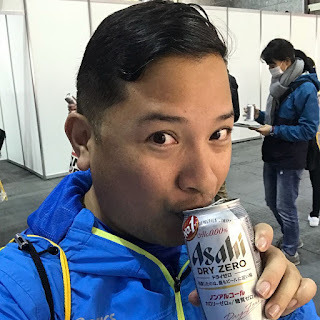 Once getting landside, I stood in line to get my "2 Day Osaka Amazing Pass," a ticket that allowed me to not only take unlimited rides on the Osaka Metro, it also provided me free entry or special discount for 35 tourist spots around the city, over the course of 48 hours. For ¥3300, or just under $30, it's a pretty amazing deal, especially if you take advantage of the discounts and free entries. I then proceeded to take a limousine bus into the city, which took me from the airport to Osaka Station in roughly an hour. This is probably the most recommended way to get from the airport to the city, costing ¥1550, or $14 USD. 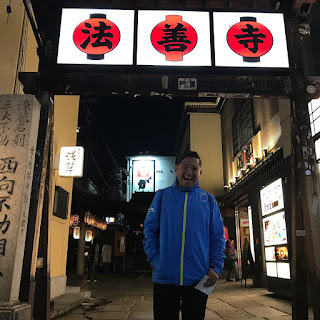 From there, I was able to experience Japanese culture firsthand, hitting the ground running (not literally... I had a suitcase with me!) while getting my bearings on the very sophisticated Osaka subway. I eventually found my way to my Airbnb to drop off my bags, at a location near the Temmabashi subway station on the Tanimachi line, just north of the Ōkawa River in the neighborhood of Tenma. I was given the combination to the lock for the mailbox, where the key to my room was located, and in I went. 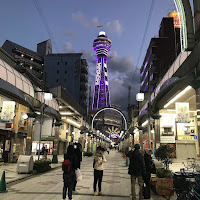 Mind you, Osaka is not too familiar/wary with Airbnb, so I was told that if I encountered anyone wondering why I was staying here or instead of a hotel, to call it a homestay/staying with friends. 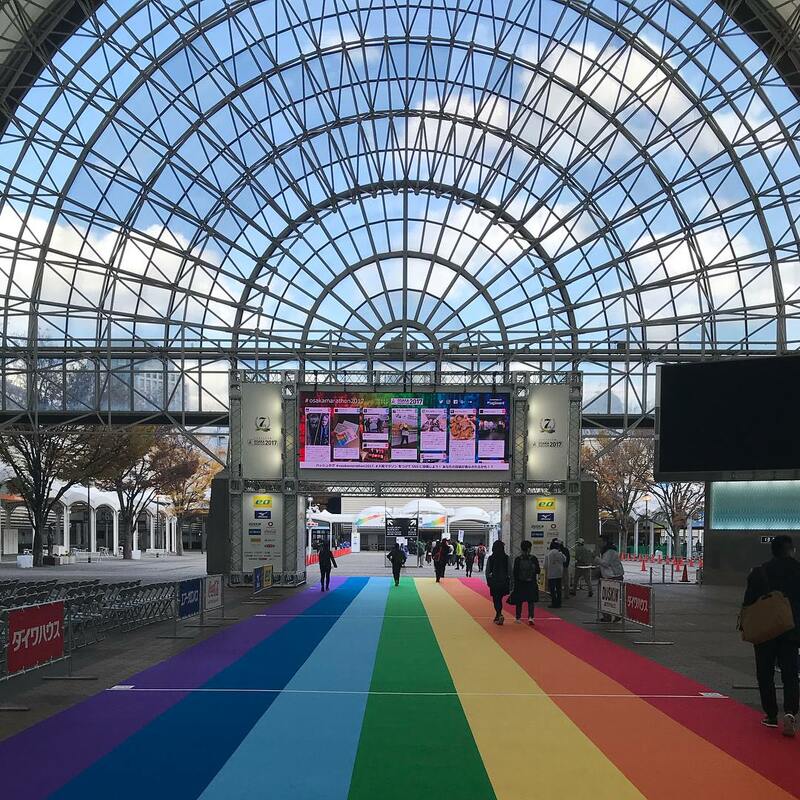 After dropping off my things, I went straight to the expo, which was quite an experience in and of itself. 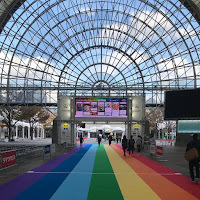 The expo was all the way on the other side of town, at the INTEX Osaka (International Exhibition Center, Osaka) on Sakishima Island, an artificial island developed in the 1970s as a planned business, exchange, and trading district in Osaka Bay. To get there, I took the metro from Temmabashi to Cosmo Square, a 23 minute train ride with a connection. It was a bit of a walk to get from the station to the expo, on a windy day. When I arrived at the expo, it was a little confusing to get through; when I registered, we were requested to pick a color that corresponds with a charity of our choosing for a portion of our race registration to go to, however we were not considered charity runners for the race. I tried to follow the basic directions as I could when picking up my packet, but ended up in multiple lines trying to figure out the process. Eventually, I was able to pick up my packet, despite the confusion. Afterward, we were directed through a multiple switchback "course" through the hall, zigzagging along past the different booths hawking official merchandise provided by Mizuno to Asahi beer to various energy drinks. It was somewhat chaotic. So much food at the expo! 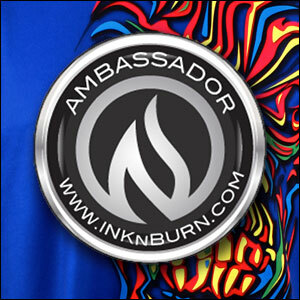 Near the end of the booths, I find the INKnBURN Japan booth, and ended up meeting with INKnBURN founder Megan Wheeler Tsuyuki, who created a local "satellite" in Japan to sell her INKnBURN products, many of which they were selling at the expo, including a special Osaka Marathon branded shirt, which I ended up purchasing. Then there was the food court - never before have I seen a huge focus on food at a race expo than here at the Osaka Marathon expo, but then again, Osaka is the culinary capital of Japan. 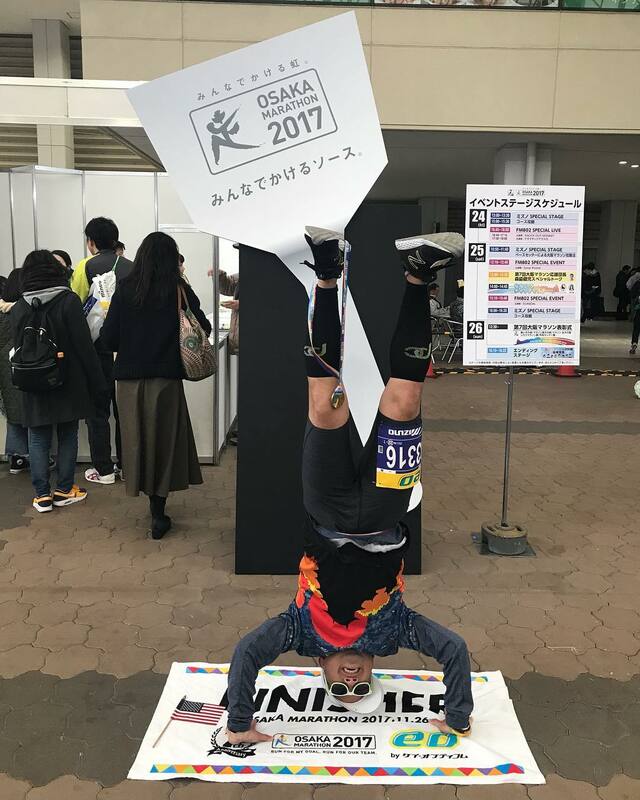 Apparently, this is common at race expos; both Tokyo and Nagoya Women's Marathon, which a few of my friends have run, have said this was present at their race expos too. Here, I have my first taste of one of Osaka's iconic dishes - okonomiyaki - a Japanese savory pancake with a batter made of flour, grated nagaimo (a type of yam), water or dashi, eggs and shredded cabbage, and filled with green onions, thin pork belly, various seafoods, and vegetables, and topped with katsuobushi (bonito flakes). It was delicious, and QUITE filling. 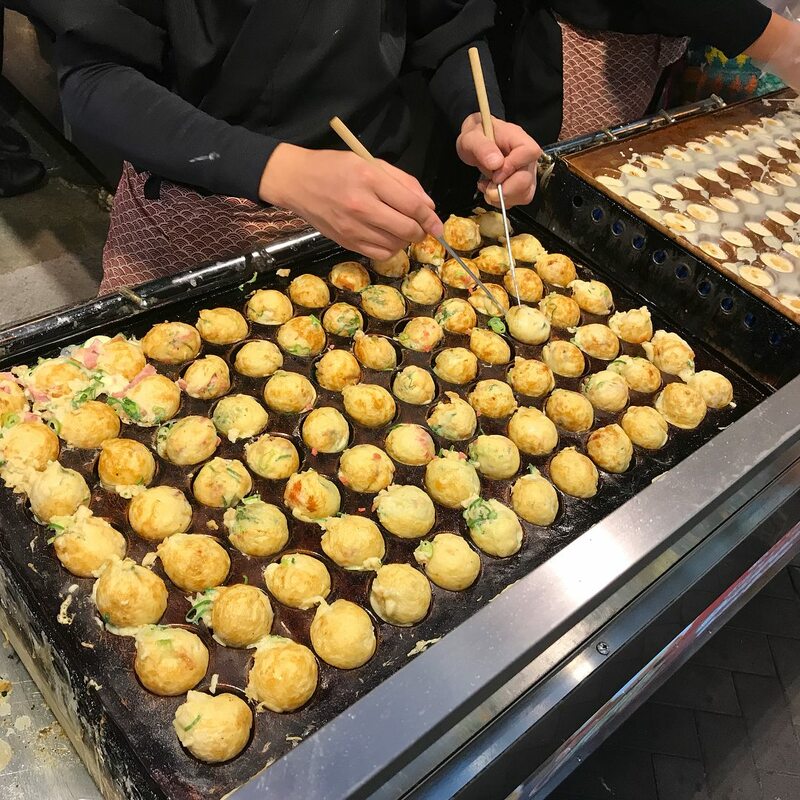 I also made room for some takoyaki, another Osaka favorite - diced octopus (tako), tempura scraps (tenkasu), pickled ginger, and green onion all in a wheat-flour based batter, then cooked into the shape of a ball in a specially molded pan. I didn't enjoy it as much as the okonomiyaki, but this would be the first chance I gave it.. maybe another try later would make it better. 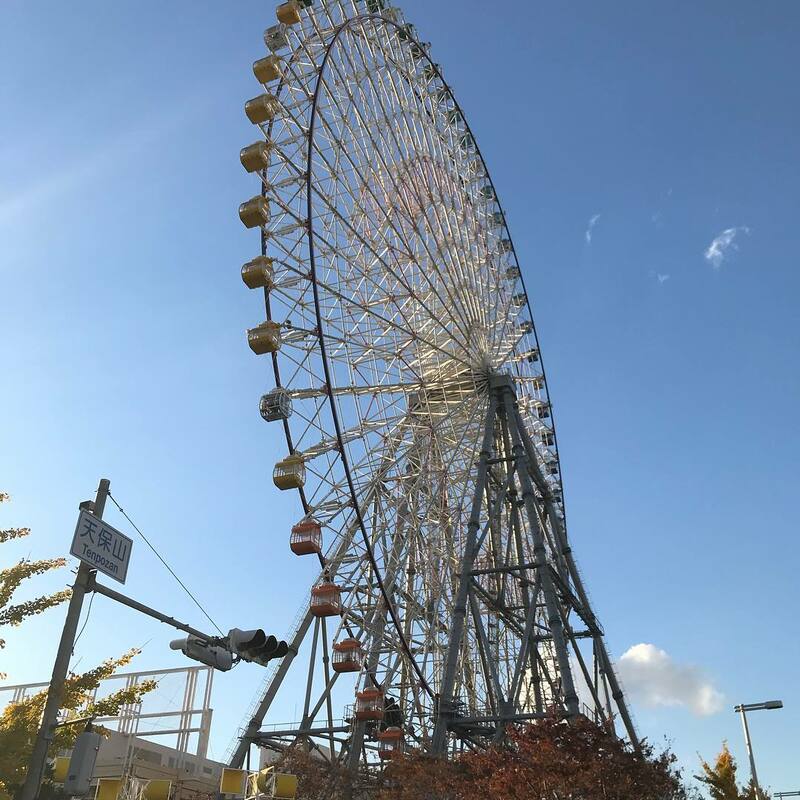 After spending a decent amount of time in the expo, I decided to make use my Osaka Amazing card for entry onto the Tempozan Ferris Wheel (at the time of its opening in 1997 the tallest ferris wheel in the world, but now in 19th place), getting an opportunity to view Osaka from 369 feet above during the 17 minute ride, then raced back into downtown to get another view now that the sun was going down at the Tsutenkaku Tower. At 338 feet tall, this tower is one of Osaka's most symbolic landmarks since it opened in 1956. 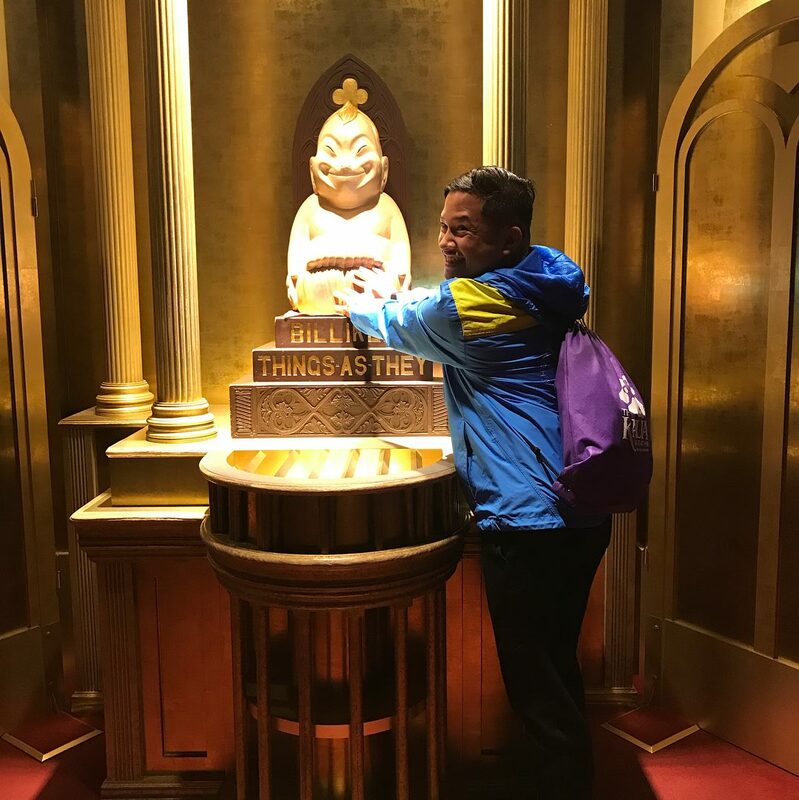 While there, the observation deck on the 5th floor has become a shrine of Billiken, the God of Happiness or "things as they ought to be." The statue of Billiken, a popular American charm doll that came to Japan in the early 20th century, became closely associated with the tower and is a popular symbol of good luck. Thousands of visitors place a coin in his donation box and rub the soles of his feet to make their wishes come true. 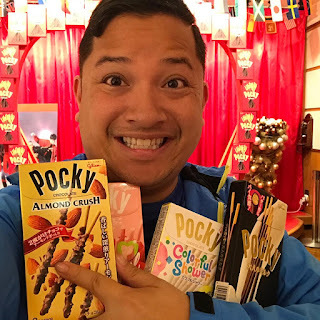 Additionally, the tower also has a floor dedicated to all things Pocky, a popular Japanese snack food of biscuit sticks usually coated with different flavored coatings, from chocolate to strawberry, to more exotic flavors such as green tea matcha and chestnut - which of course, I bought lots of to bring back home to friends, especially flavors that are unique to Japan, and aren't sold in the US! 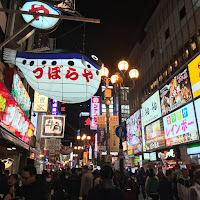 It was still somewhat early, so before heading home, I decided to make a trip into the what can be deemed the "pure essence of Osaka," the Dotonbori District, to take advantage of the Japan Night Tour, another offering of the Osaka Amazing Pass. 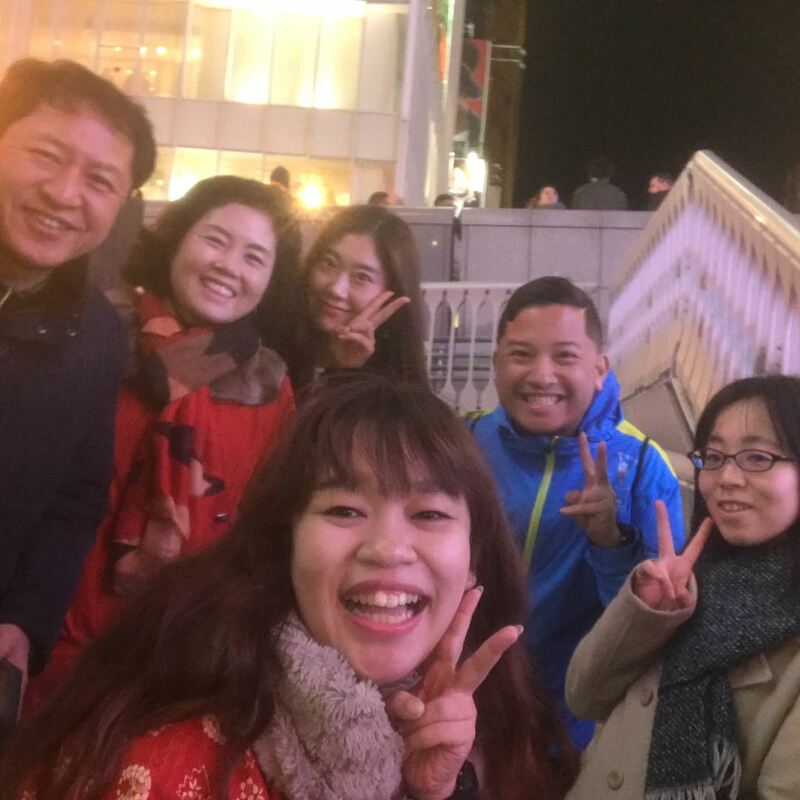 With multilingual guide Hachhan (who spoke not only Japanese, but also English and Korean,) I joined a small tour group of four other people and visited various sites all around the Shinsaibashi and Dotonbori area. Stops included Hozenji Temple, located right in the center of this district (providing some beautiful ambience with beautiful paper lanterns lighting the adjacent street, Hozenji Yokocho, which literally means "street beside Hozenji;") Ukiyo Koji, a neighboring alleyway that served as a miniature history museum featuring reproduction maps of the cityscapes of Shinsaibashi and Dotonbori as they would have appeared in the Taisho Period to early Showa Period; the Aiaubashi Bridge, the site of a 300+ year old bridge regarded as a place where couples could sever their ties to each other; and the famous giant "Glico running man" neon billboard, installed in 1935 as an advertisement for the Glico confectionery company - all during the 45 minute tour. 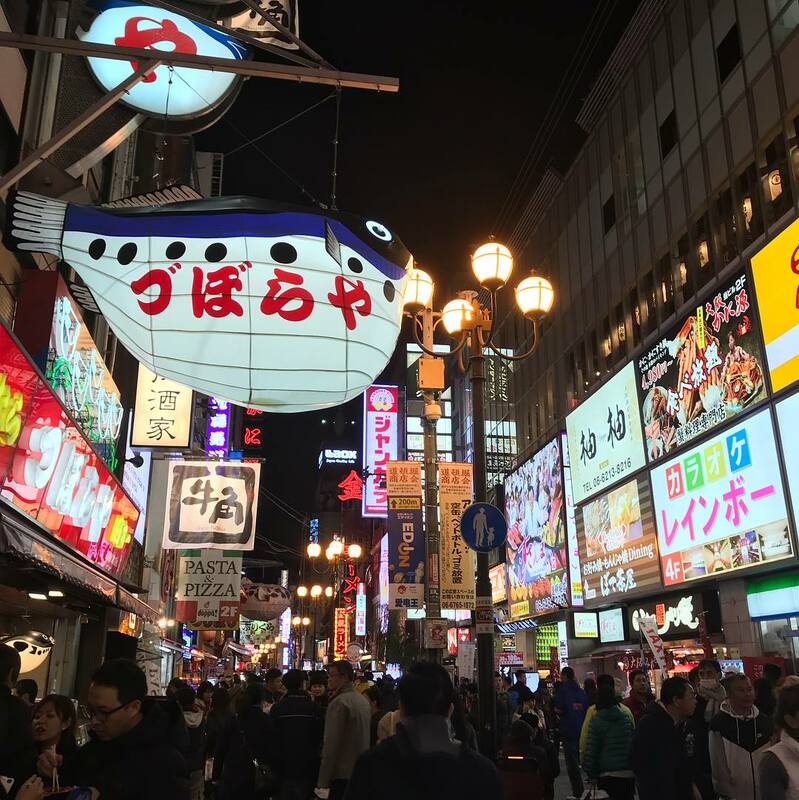 Of course, the tour also included recommendations of the best food to find in Dotonbori - some of the food Osaka is famous for can be found in food stalls all around the area. 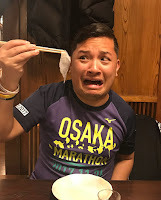 Osaka, in fact, even has its own word closely associated with the Dotonbori district to describe its food culture... the word "kuidaore" is a Japanese word literally meaning, "to ruin oneself by extravagance in food." Before the evening ended, I tried takoyaki one more time... and once again, it wasn't for me. To me, it tasted like tires, or rubber... maybe the octopus texture just wasn't the way I like it (I prefer my octopus to be grilled!) I headed back to my Airbnb, ready to crash after a full day of sightseeing... with still much much more to do! 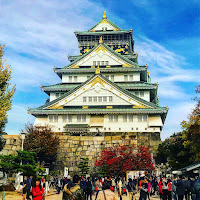 I woke up early the next morning, ready to take on a very full day of sightseeing, all using my Osaka Amazing card! First up was the Shitennoji Temple, regarded as the first Buddhist and one of the oldest temples in all of Japan. It was founded in the year 593 by Prince Shōtoku, a practicing Buddhist when Buddhism was still not widespread in Japan. He named the temple after the shitenno: four heavenly kings of Buddhist tradition who guard the world from evil. The prince had prayed to these kings during a time of war, and when the war was over he had the temple built in order to give thanks. While some of the buildings have been destroyed by fire and rebuilt multiple times over the centuries, they have always been carefully reconstructed to reflect the original 6th century design. 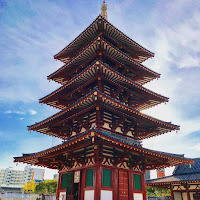 In the pebble covered courtyard of the inner precinct stand a five-storied pagoda that can be entered and ascended, and the Main Hall (Kondo) in which Prince Shotoku is enshrined. 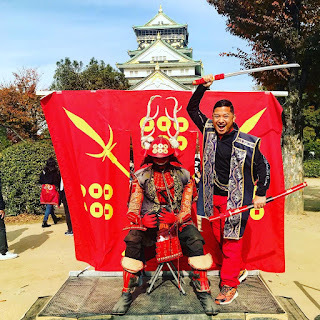 Hoping to get there early enough before most tourists would show up midday, I then headed up to Osaka Castle Park, to see one of Japan's most famous landmarks. Osaka Castle, which sits on 15 acres of land, played a major role in the unification of Japan during the sixteenth century of the Azuchi-Momoyama period; in addition to a tour of the turrets that surround the castle (some of the oldest structures in the whole complex) and learning about its defenses and surveillance methods, I toured all eight stories of the main castle, which was recently restored in 1997 to it's Edo-era splendor, starting from the top down. It was a very busy morning, though -- already full of tourists, so there was a little bit of a wait to get in. For the most part, I was able to get the gist of the 521-year history of this important landmark, in addition to admiring the beautiful views from its observation deck on the top floor. Located on the southeastern end of the Osaka Castle Park is the Peace Osaka, also known as the Osaka International Peace Center. This museum was very informative, focusing on the destruction of Osaka after the air raids in World War II, as well as the broader themes of the tragedy of war and the importance of peace. I've been told an even more informative museum along the same themes exists in Hiroshima (where one of the atomic bombs during the war was dropped), but I highly recommend this one in Osaka, especially for English speakers, as there is an audio guide, some video presentations, and some exhibits all translated into English. After a quick ramen to ease my hungriness for lunch at a nondescript ramen shop nearby, I headed down to Tennoji Park, where I seemed to walk into a dog meetup of some sort, since there were dogs all of the Shiba Inu breed wandering all around the park with their owners. I even witnessed one of the most strange things ever - a group of people seemingly doing line dances with their dogs. In any case, after walking through this veritable "twilight zone," I headed over to the Tennoji Zoo, Japan’s second largest and third oldest zoo, having opened in 1915. The 11-hectare zoo is a nice escape from the hustle and bustle of the city, but not a particular interesting place - it contained many animals I've seen before, and in better maintained facilities. Before dinner back in Dotonbori later that night, I fit in one more site before most of the museums closed for the day - the Kamigata Ukiyo-e Museum. 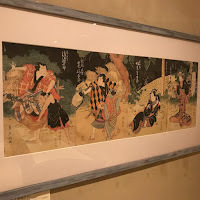 Also included as part of the Osaka Amazing Pass, this museum is a small, but impressive private museum and the only one of its kind, showcasing the traditional Ukiyo-e woodblock prints of the Kamigata region (what the Osaka-Kyoto region was commonly called during the Edo period.) 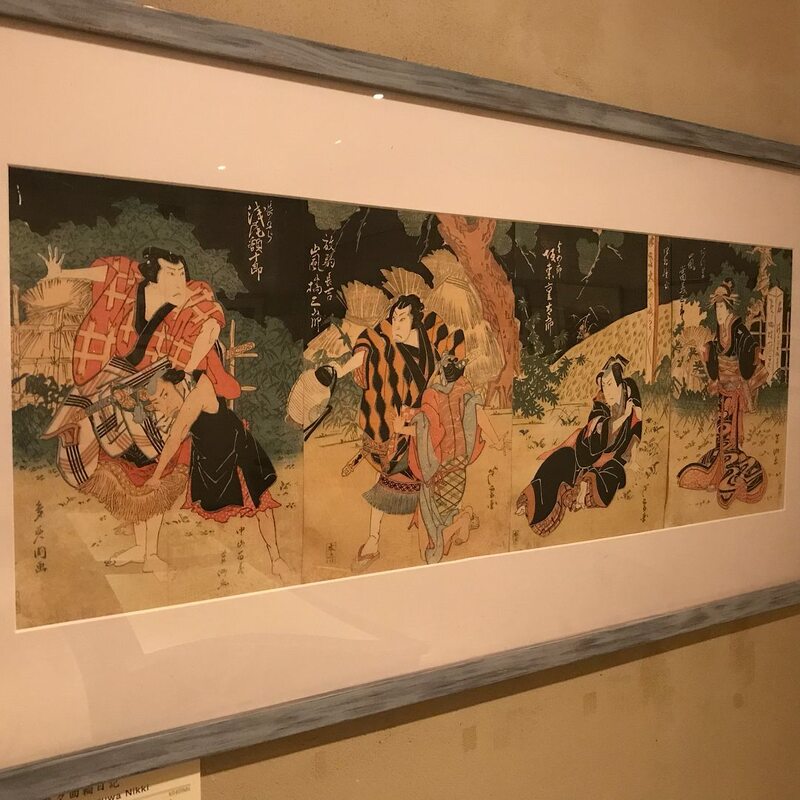 These prints had much more realistic depictions than in other printmaking styles in Japan, tending to express the true personalities of their subjects. 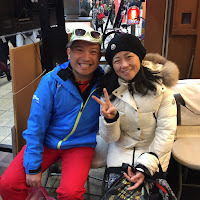 After perusing the beautiful works of art, I met up at a restaurant found by my friend Febry from California, who was running the race as well. Joining her and a few of her friends also coming to visit Japan, we had a delicious carbo-load fest on an Osaka favorite, kushikatsu, skewers of deep-fried assorted meat and vegetables. Probably not the best carb-loading due to all the oil, but it still hit the spot. Ferry and I, ready for the race! Afterward, we then got some Kyoto-style coffee at Caffe UCC, a sit down location of a popular coffee company, Ueshima Coffee Company, that manufactures coffee and tea products in nearby Kobe, but owns a coffee farm in Hawaii. There, I had my eye on trying a unique slow-drip coffee brewed with a siphon, that was made popular in the nearby city of coffee. Kyoto-style slow drip coffee is made by letting water slowly, drop by drop, drip over coffee grounds. As this process has evolved, Kyoto-style brewers have become more and more elegant. These brewers now resemble tall, gilded hourglasses. After enjoying my cup of coffee as a nightcap, I headed back to my Airbnb to get my rest because the next morning was race day! 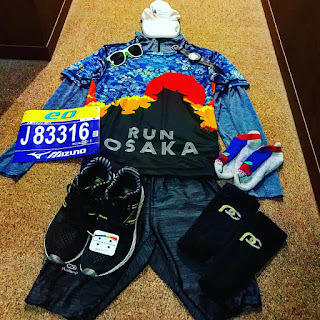 Like most international races, Osaka has a later start at 9, so wake up a couple hours earlier around 7am. Thankfully for me, it was an easy 20 minute walk from my Airbnb to my corral, which I had mapped out the night before. 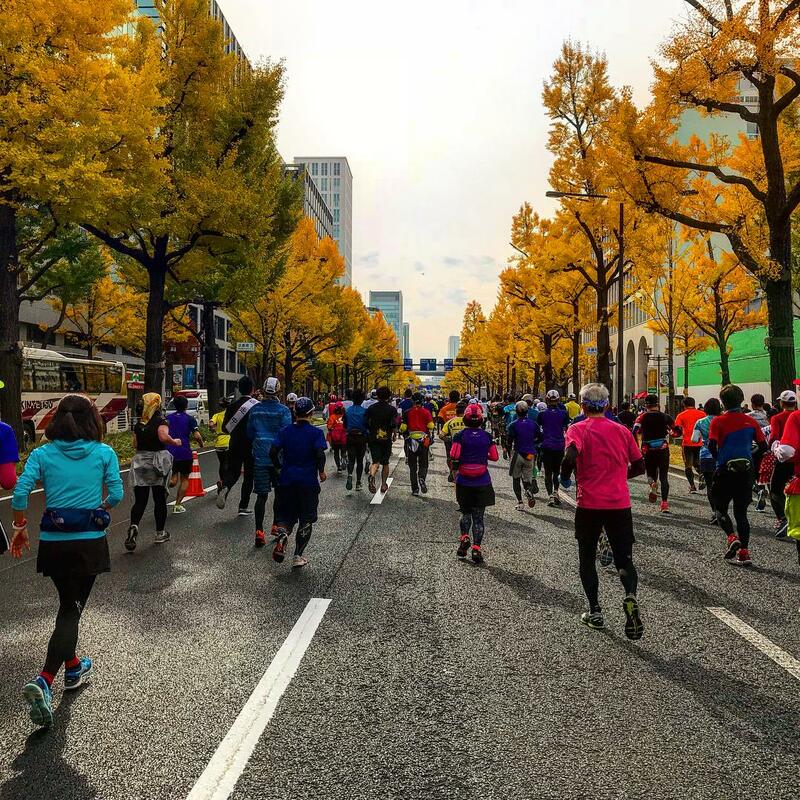 It's a chilly race morning in the low 40s as runners assemble on the roads northeast of Osaka Castle. 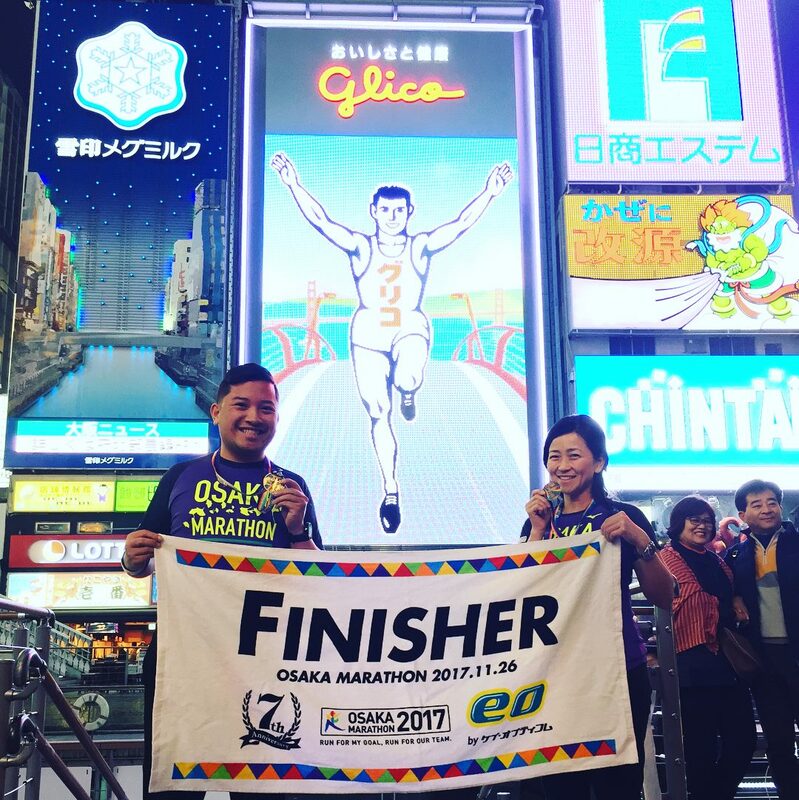 Lots of people are wearing shirts from other marathons in Japan, and it is no surprise to me that there are many of them in this country! 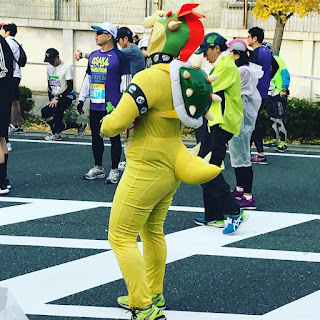 Additionally, there are lots of costume-wearing runners - among them, I see a guy dressed in a full body suit as "Bowser" from the Super Mario series. The race begins, and it is pretty crowded as we make our way down Uemachi-suji, the main road west of the castle. In the first ten minutes of the race, there were lots of walkers around me, and several bottlenecks just after crossing the start mats - it seemed that there were more than a few Japanese celebrities participating in the race (more likely the much shorter 8.8 kilometer Challenge Run) that had tv crews around them and other runners with their camera phones out taking pictures. Lots of people dress up for the races... even as Bowser! I wanna throw a blue shell at him! We continued down the road, turning left along Hommachi-Don, eventually running underneath the elevated highway. We hit the first mile mark as we made a right turn past the bustling Morinomiya station at the southeast corner of Osaka Castle Park. 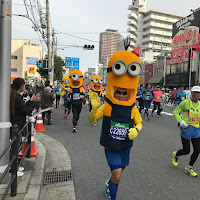 We would run a little over a mile down Tamatsukuri-suji, and along the way, I saw four runners dressed in full-on Minion costumes just ahead of me. 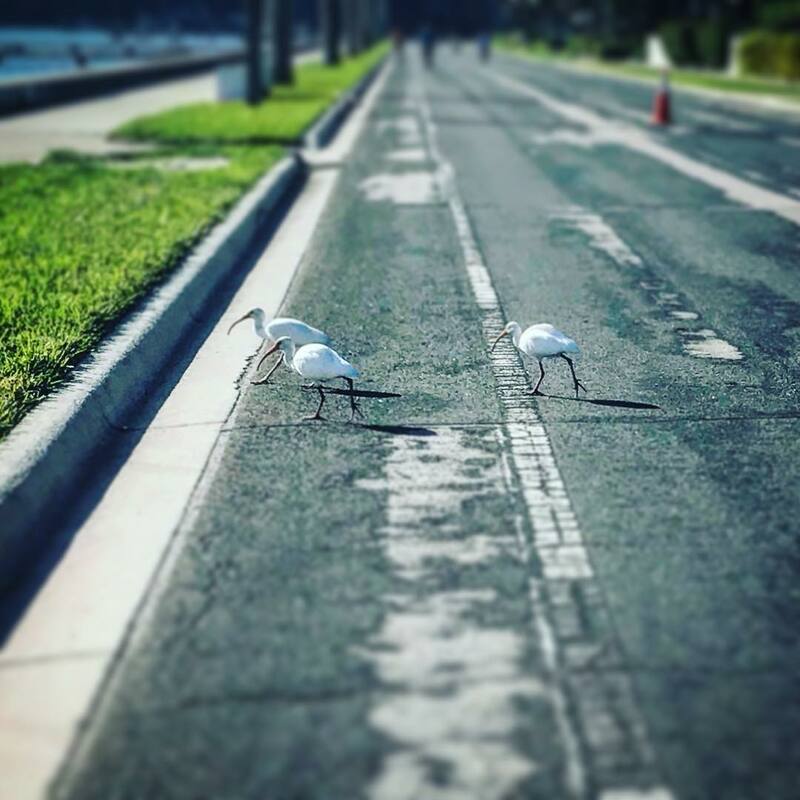 I picked up my speed a bit to get in front of them so I could capture them running past me with my cameraphone. Before long, we were turning right along Sennichimae-dori, reaching our first real hill of the race. It wasn't very big or long, so soon, we were making our way downhill, with an impressive view of the thousands of runners ahead of us, passing underneath the Hanshin Expressway and Nippombashi Station. Passing Namba Station, we turned left onto Mido-suji Boulevard, one of the most beautiful parts of the route, and the first part of the route we'd be repeating on an out-and-back section later in the race. 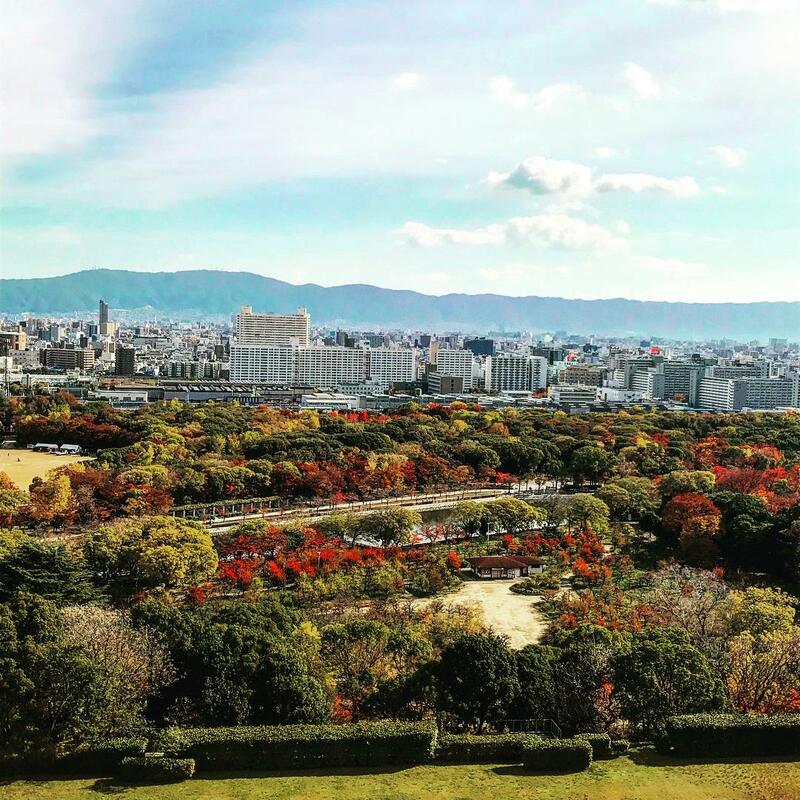 Considered the primary main street of Central Osaka, Mido-suji is lined with ginkgo trees on both sides, and during the fall, the leaves turn into a most brilliant yellow color. The line of yellow trees seems endless. 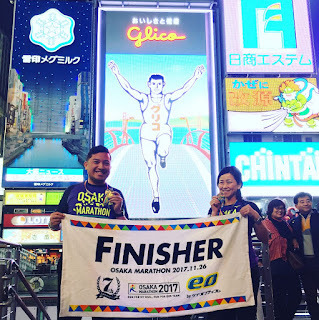 Here, we would be running for about 1.75 miles, passing some of the more high-end shopping areas of the city as well as running over the famous Dotonbori Bridge, which I had seen two nights before on my night walk tour. The Challenge Runners would also be running this segment of the route with the marathoners right up to their finish line ahead. 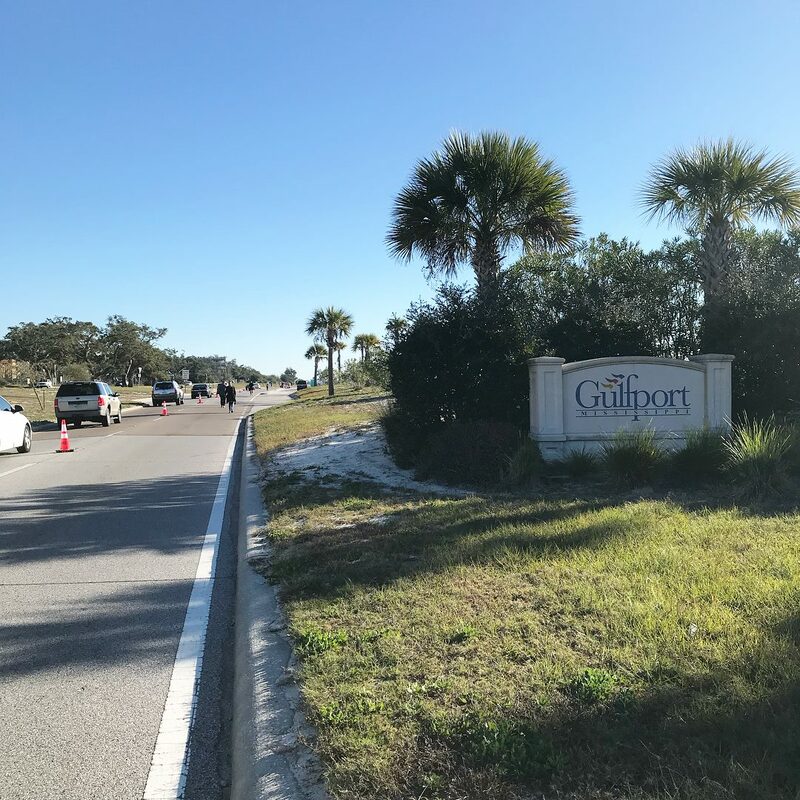 Because of the turn off for the marathoners, we were being regularly asked to move to the right to the much narrower frontage road, while the Challenge Runners would be to the left in the wide main street. 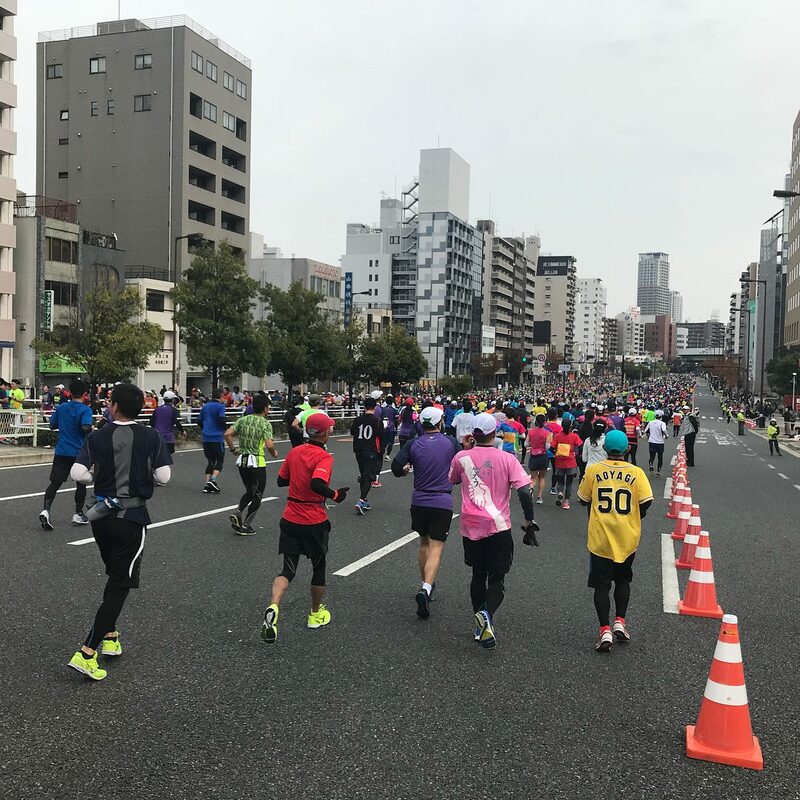 This was slightly frustrating, as there were many more marathon runners than challenge runners, so it felt as if we were being herded like cattle into this small area of road. Before long, we split off to the right as the Challenge Runners made their way to their finish line in front of Osaka City Hall. 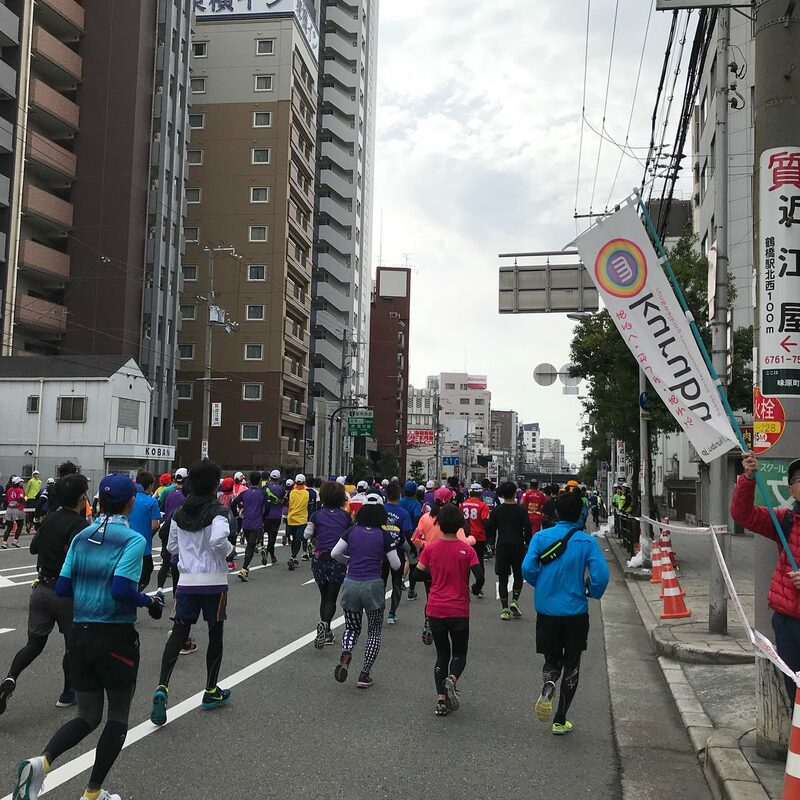 Marathoners went along a 1.5 mile route on Tosabori-dori Street, just one street away from the Kyu-Yodo River. It was an out-and-back route, as many runners were going in both directions on either side of the wide street. 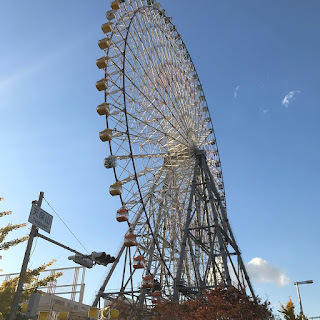 We'd eventually make a turnaround near the Osaka Business Park, returning right back along Tosabori-dori, turning right onto Naniwa Bridge (best known for its pair of stone lion statues) and onto Nakanoshima Island. Nakanoshima Island is actually a narrow sandbank that divides the Kyu-Yodo River into the Tosabori and Dojima Rivers. Many governmental and commercial offices (including the city hall of Osaka), museums and other cultural facilities are located on Nakanoshima. 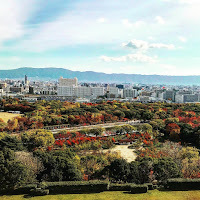 The island also contains Osaka's first public park, Nakanoshima Park, which was opened in 1891 shortly after the city was founded. 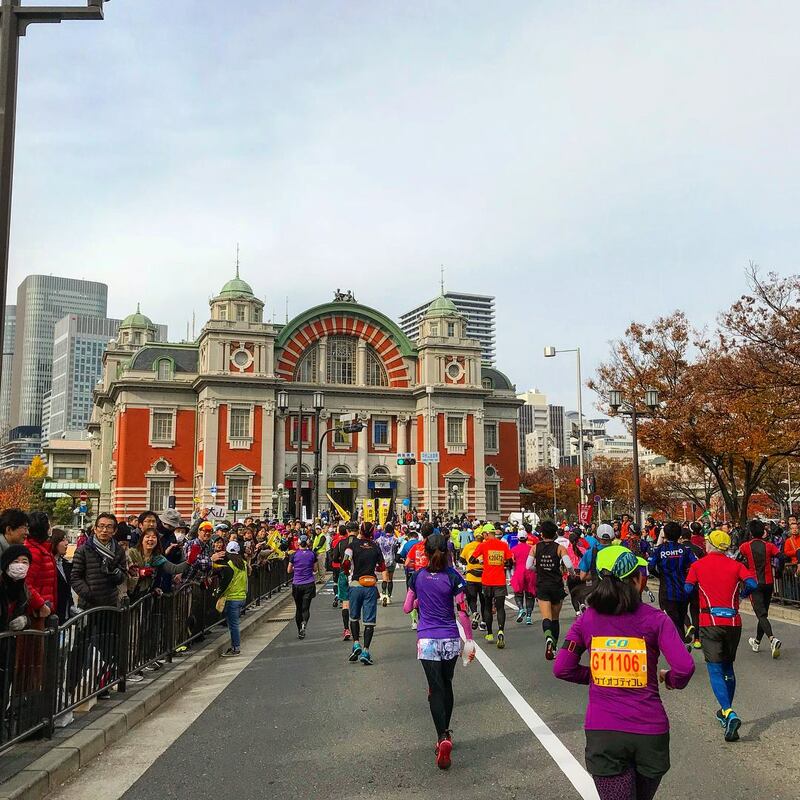 As we continued along the route through the island, we ran past an attractive red-bricked building, which I later found out was the Osaka Central Public Hall, a beautiful Neo-Renaissance building completed in 1918. It was great hearing "Ganbatte" (Japanese for "good luck") or "Fighto!" yelled out by the many spectators that lined the streets here. 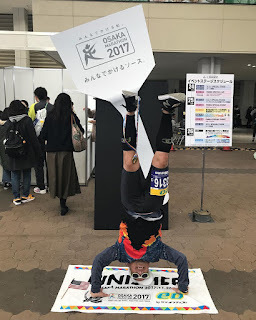 I did my best, to utter out a breathless "Arigato!" or "Thank You!" whenever I could. We were even entertained by a kids' cheerleading team, cutely dressed in obviously American-inspired cheerleading outfits! 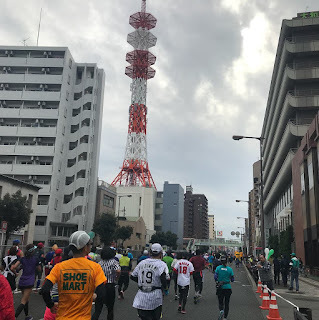 We rounded the corner past Osaka City Hall, seeing the tail end of Challenge Run participants crossing their finsh line, as we continued on the return 1.75 section of the Mido-suji Boulevard, with a bit more space to be able to run on. By the time we got back down past the Dotonbori district, we were over 10.5 miles into the race. Impressive... a full samurai costume! 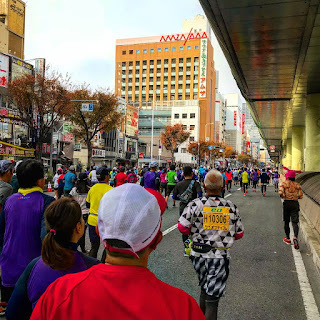 We turned right onto Sennichimae Dori, now making our way further west, as we ran underneath an elevated highway once again. Soon, the elevated highway veered left, and we were left exposed, with the slightest increase in elevation up ahead, but that was because we were crossing the Taisho Bridge over the Kizu River. From the bridge, we could see the unmistakable dome of the Kyocera Dome Osaka, a 51,000 seat baseball stadium that's home to Orix Buffaloes, a Nippon Professional Baseball team. We made a slight right turn over another bridge, and then headed out to yet another turnaround point. 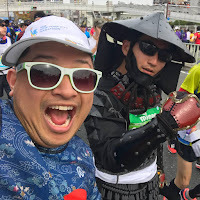 Along the way, I got to see a few other notable costumes - like a runner dressed as a Kikkoman Soy Sauce bottle, and a another runner in a full samurai warrior outfit! As we made our way back, we finally reached the halfway point of the course, as we traced our way back to the node that we had turned already a few times on at Mido-suji Boulevard. There, we turned right, and began our southward jaunt right into the heart of Osaka's Naniwa Ward. While we ran down a largely commercial street which makes up part of Japan's National Route 25, much of the rest of the area is pretty residential. Past Daikokucho station, we turned right, and ran yet another out-and-back section (though a short one), lined with monotonous high rises aplenty - though high rises a little smaller than those in the downtown. In the distance however, we could see Tsutenkaku Tower, before turning back. 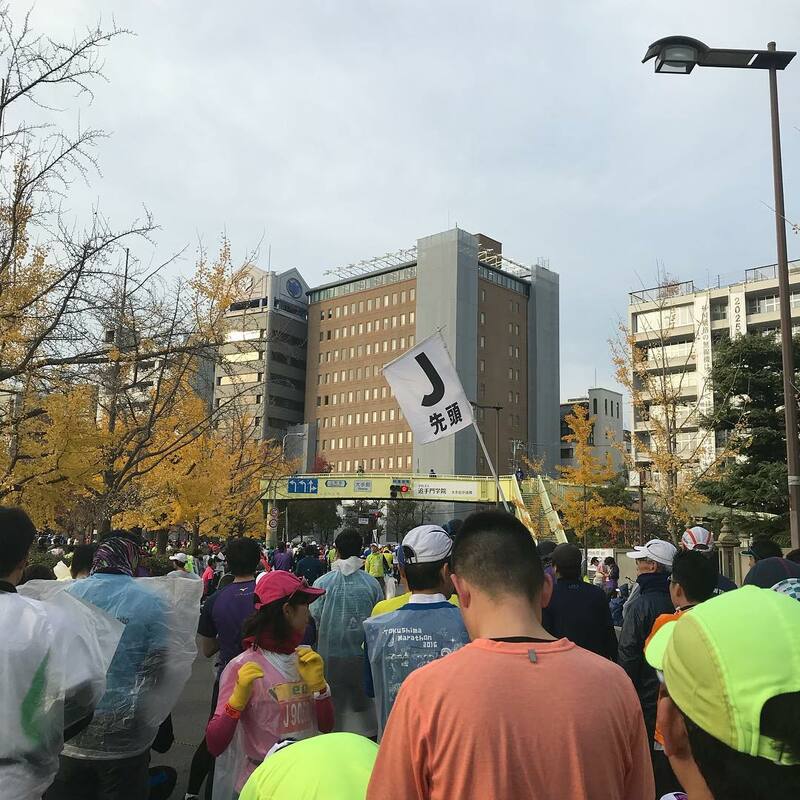 After the 25km mark, we reached another turn onto Naniwa-suji, heading south once more into the Nishinari Ward. While a bit quieter than what we had run earlier, this section of the race was a bit repetitive and a little boring, to be honest; it was mostly all the same views. 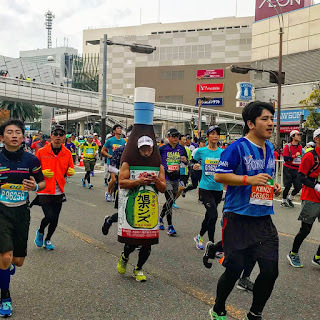 I did notice though, that where there were spectators lined, they knew how far into the race we were and provided random runners with much needed Salonpas type pain relief-spray, as we soldiered on in this second half of the race. So many TV towers, everywhere we went! 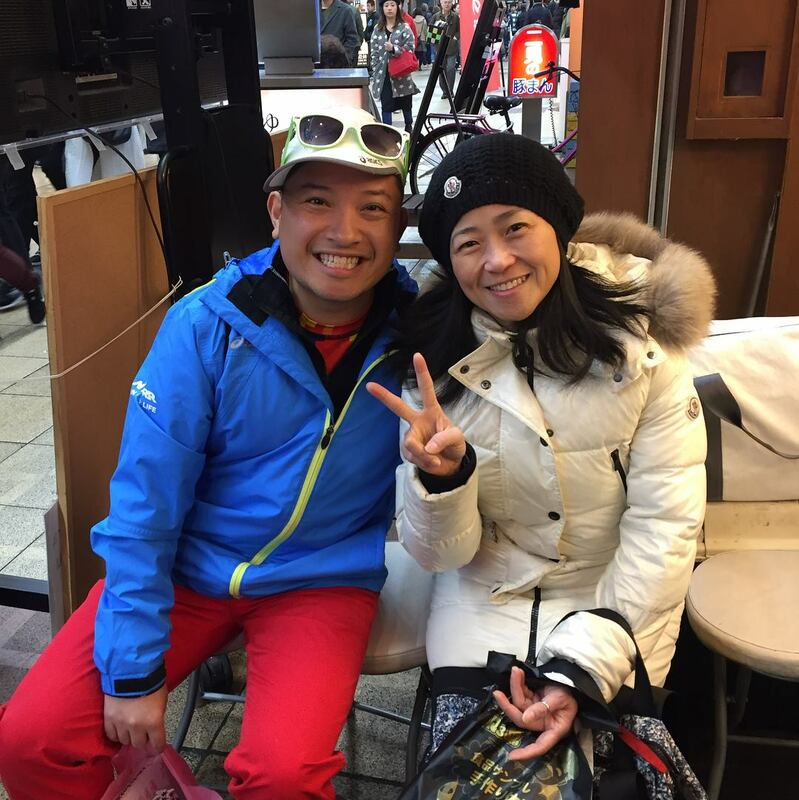 Enjoying the Maido Aid station! Eventually, we were continuing south along Japan's National Route 26, a highway with its lanes divided by a metal barrier. We passed the 30k mark then turned right onto Nanko-dori, a road with a manicured topiary along the median, as we approached Osaka's Suminoe ward. Another turn took us onto another road, where long roads of tables lie in front of us. 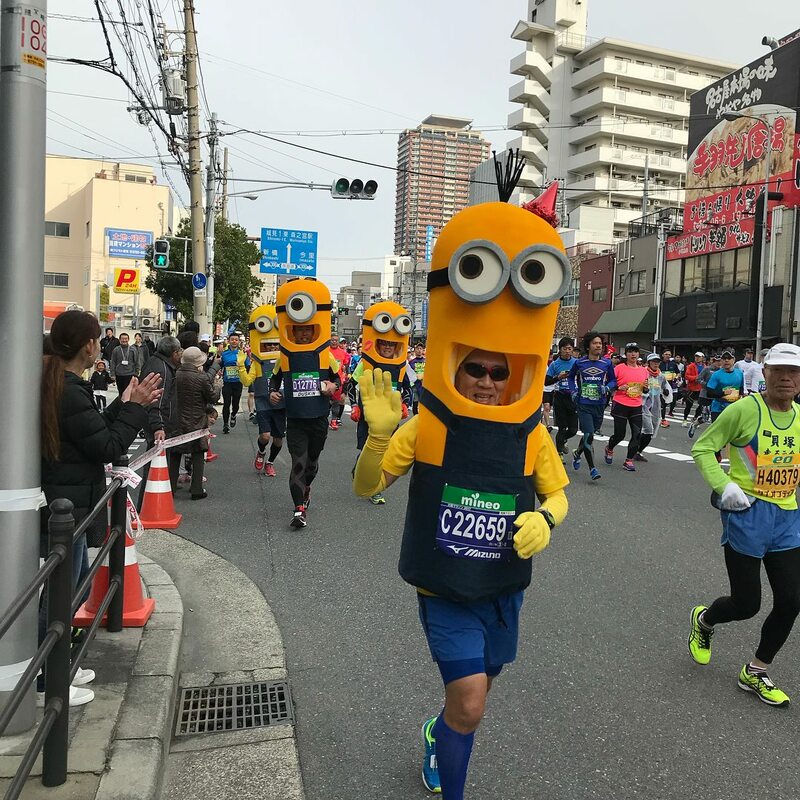 The "kuidaore" was out in full force as we passed the 32.5 kilometer mark, approximately 20 miles into the race. 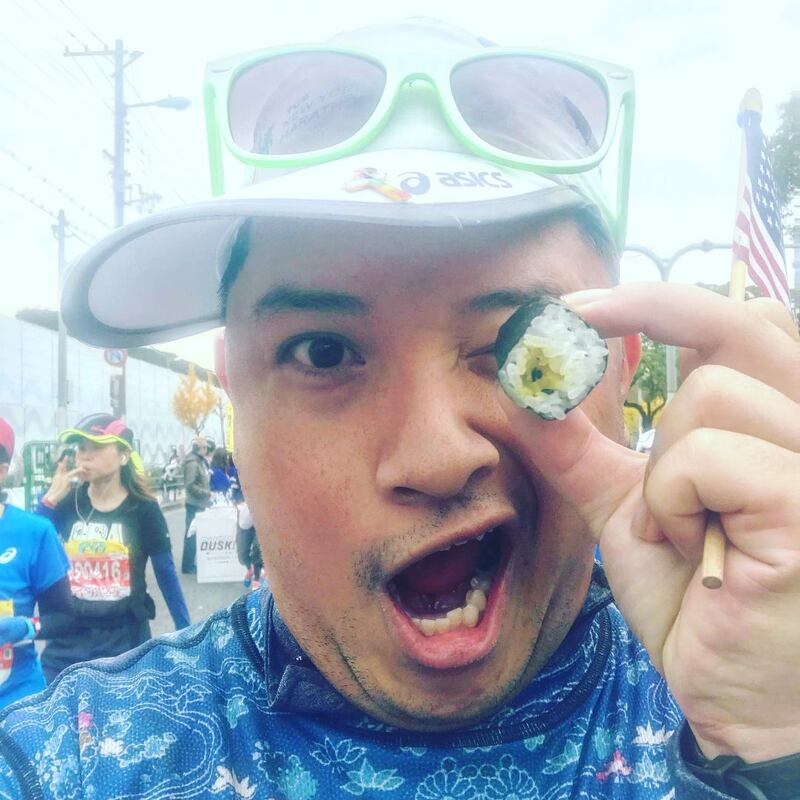 The "Maido Aid" station, passes out amazing local food to runners, homemade bites of food made with care by people from local food vendors! Among the treats were takoyaki (again!??) rice balls, bean jam buns, and cucumber rolls! If anything, I realized the Japanese had perfected the way to get past the infamous "wall" during a marathon... feed all the runners! Lots of dress-up on the course! We turned right as we approached a lime green pedestrian bridge over the street, beginning our westward course on Suminoe-dori toward Sakishima Island, where the finish line was located, at the INTEX Osaka Building, site of the race expo. The street was lined shoulder to shoulder by so many spectators at this point, as they cheered us in with less than 10K left in the race. Among those spectators were many dressed in elaborate costumes, that I made sure to get selfies with! Overhead, the tramway for the Nankō Port Town Line (known to locals as the "New Tram") rumbled, with trains heading in and out of Sakishima Island. We passed a few large boat docks as we continued on toward the finish, passing the 35K mark. We turned right as the road ahead merged with the elevated highway, eventually taking a ramp upward to the highway, which we ran along shortly as we crossed over onto the island, then followed the course as it made its way around to INTEX Osaka. The rain began to lightly fall as we approached the 38k mark, as we rounded the corner to the convention center. I crossed the finish line in 4:56:07, thrilled to be back under 5 hours for a marathon! 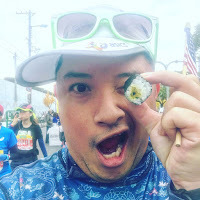 After grabbing my photo in front of an okonomiyaki spatula (known as "kotekote" in Japanese) statue, I slowly walked back over to the Cosmosquare Metro station, and began the long trip back to my Airbnb near the startline. 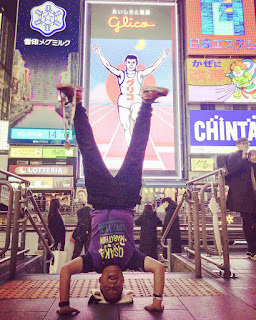 Victory Headstand #1... with the okonomiyaki spatula! Showing off my newest bling! After showering and a long afternoon nap, I got back together with Febry and her friends for dinner that night, where we headed into the Namba area to get sushi. We all decided to be daring and try fugu, or puffer fish, a delicacy in Japan. Fugu can be lethally poisonous due to toxins in its skin; therefore, it must be carefully prepared to remove toxic parts and to avoid contaminating the meat. 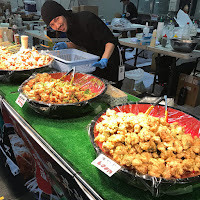 The restaurant preparation of fugu is strictly controlled by law in Japan, and only chefs who have qualified after three or more years of rigorous training are allowed to prepare the fish. We ordered fugu prepared three ways: sashimi, karaage, and shabu shabu. Additionally, we enjoyed some assorted sushi- both seafood and beef (tataki and niku), fried eggplant with miso (nasu nisyokudengaku), seasoned mackerel with sesame (goma saba), roast beef (rosuto beefu steiki), and five kinds of assorted sashimi (tsukuri mori Gosyumori). The whole meal was quite filling... and good thing - I didn't die from the fugu! In fact, it was very tasty! 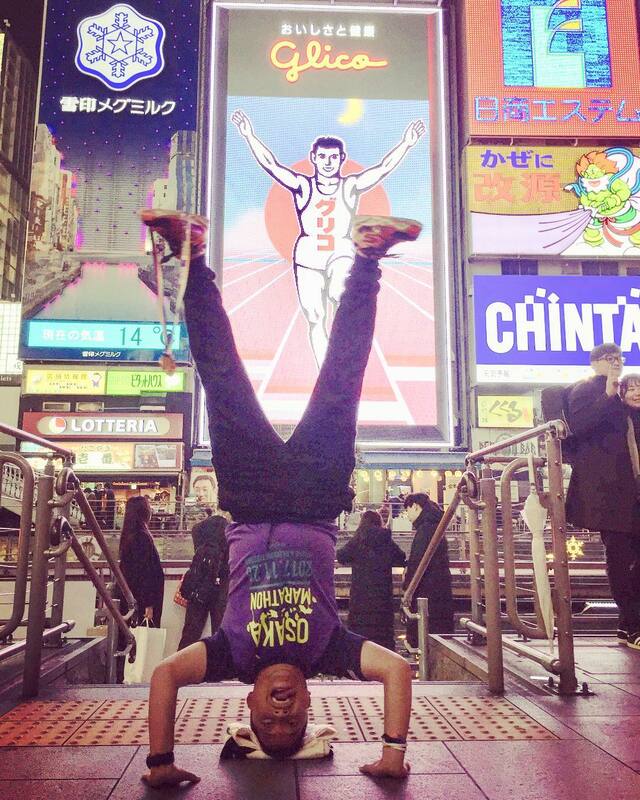 We all walked over Dotonbori after our meal for Febry and I to get photos with our finisher medals in front of the Glico sign, and then I headed home to pack and get some much needed sleep. The next morning, I was leaving Japan to fly off to Korea for two days! 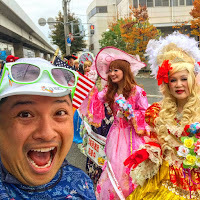 Osaka was such a fun trip - and it's only a small part of Japanese culture. 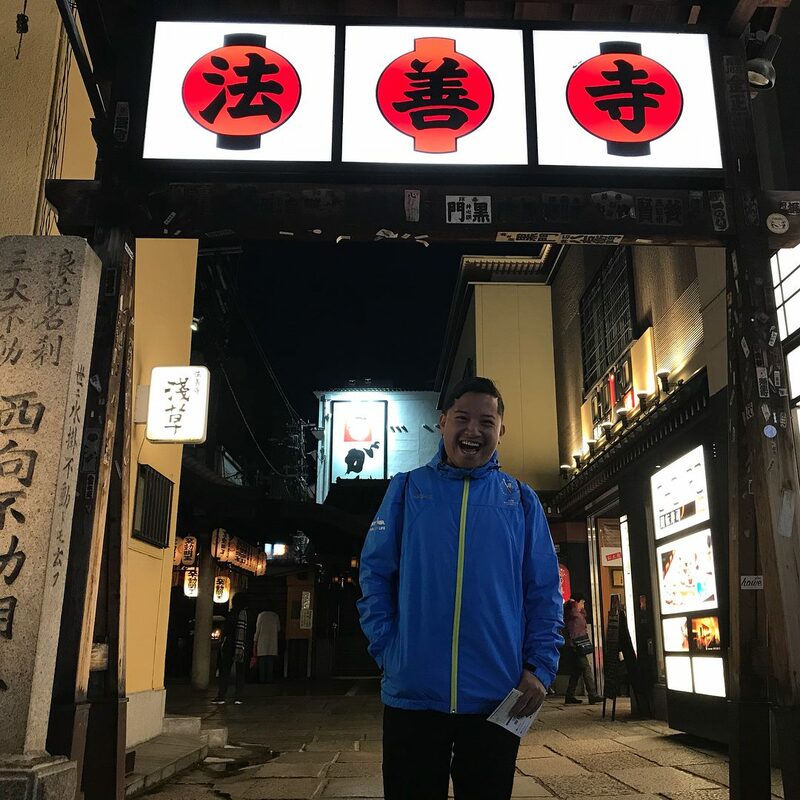 I was so glad to be able to experience so much in the few days I was there, and also enjoy the incredible cuisine in Japan's food capital.